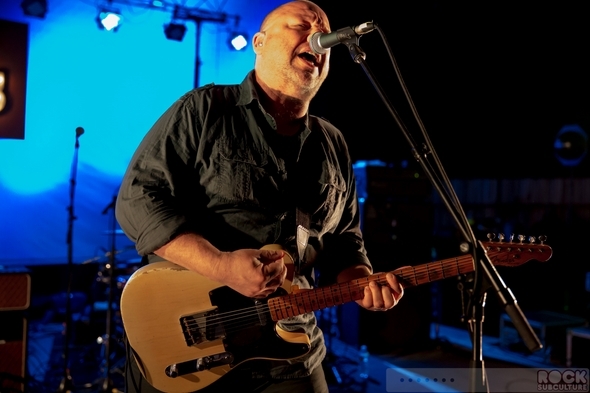 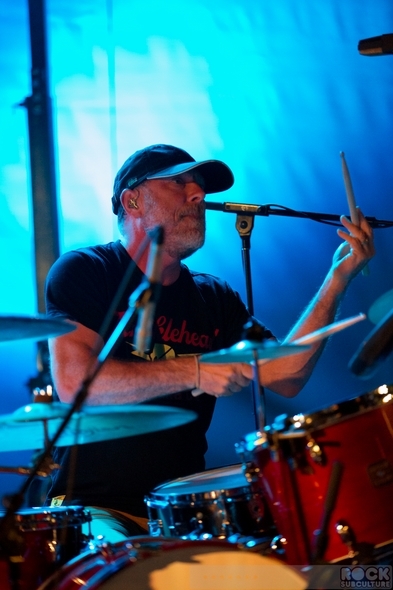 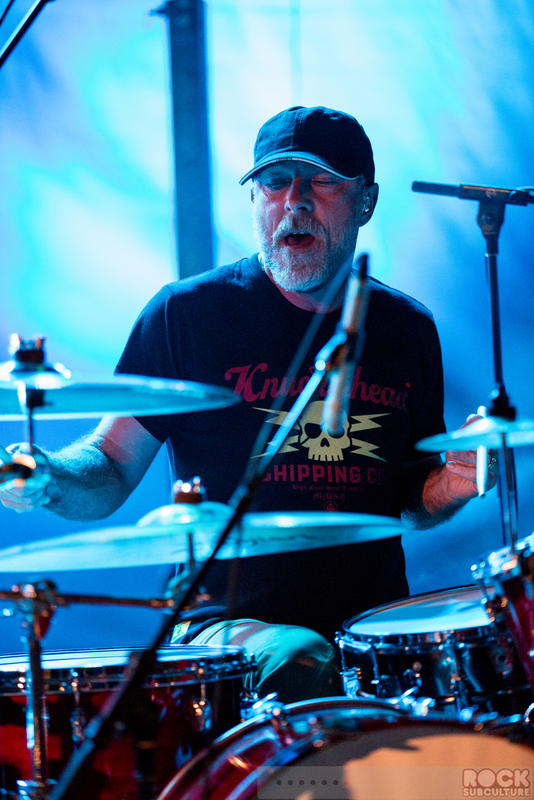 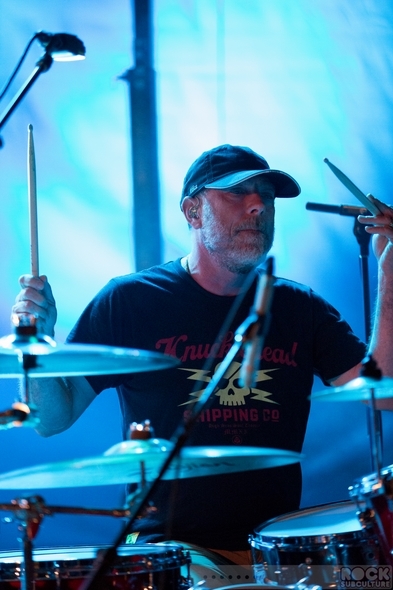 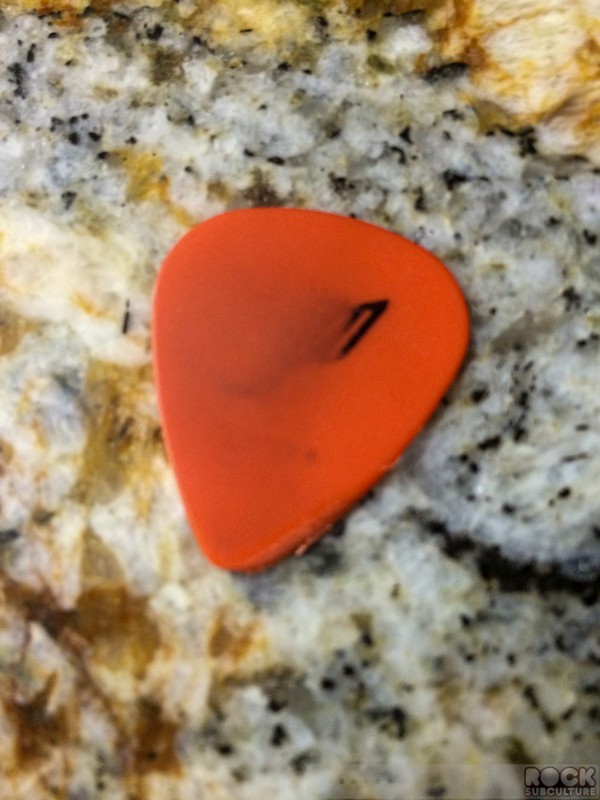 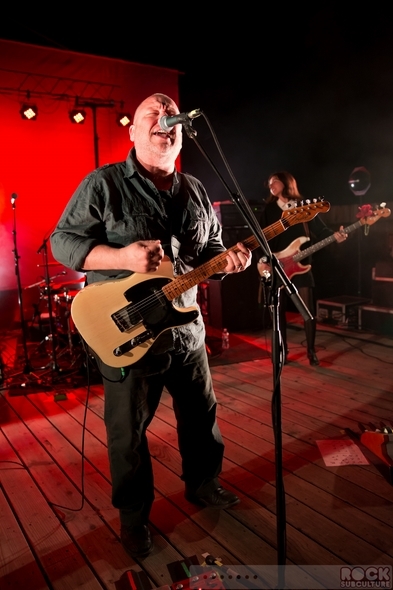 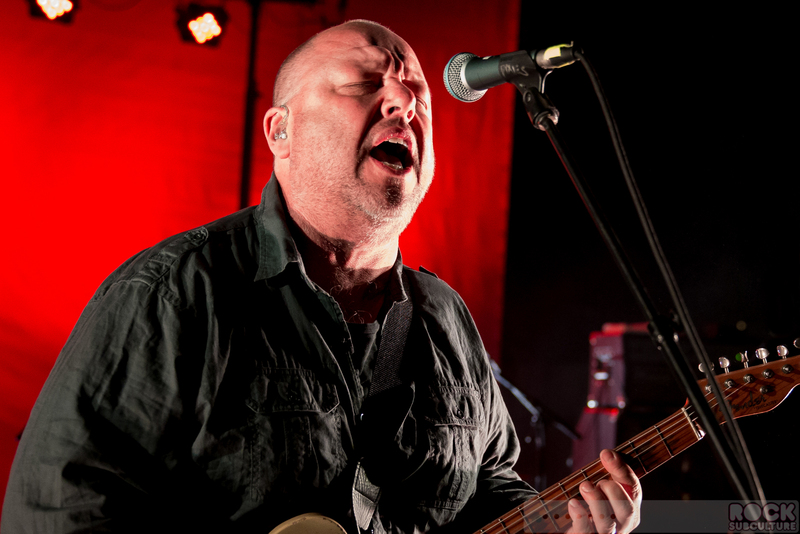 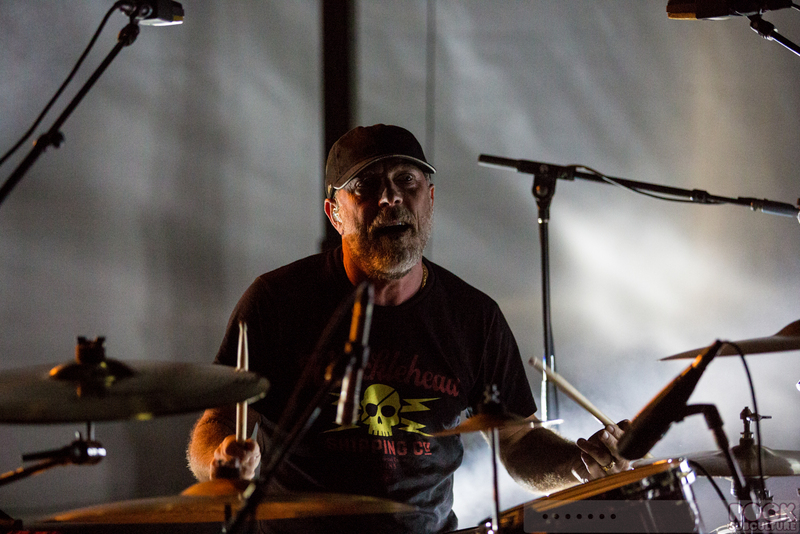 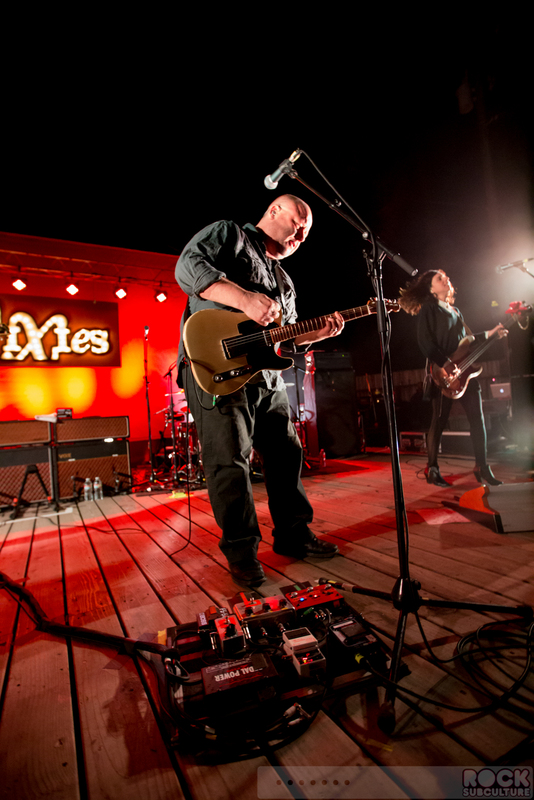 I was fortunate enough to catch a few of the Los Angeles shows that the Pixies put on last year, as they embarked on this new phase in their careers (sans founding member and original bassist/vocalist Kim Deal), as well as the show in Oakland back in February. 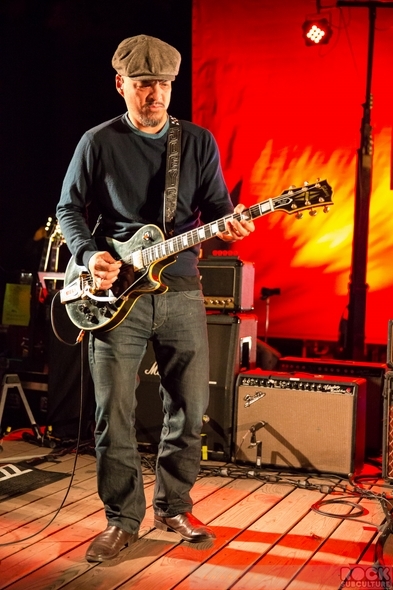 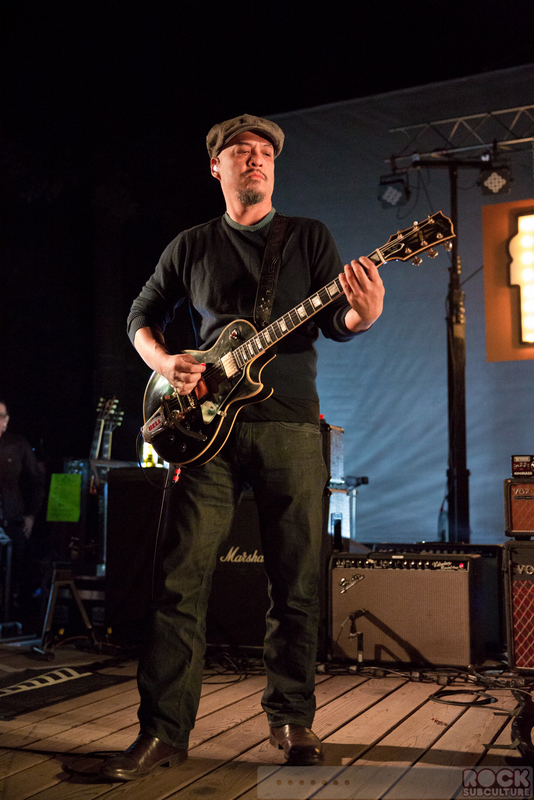 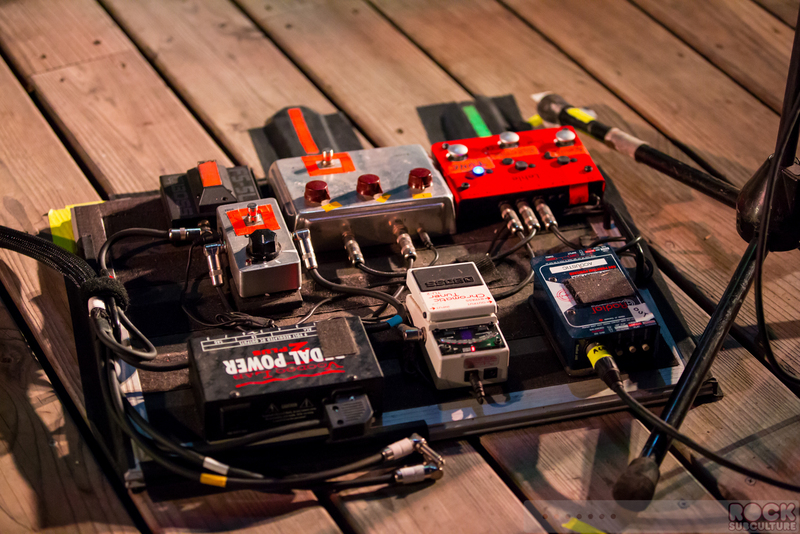 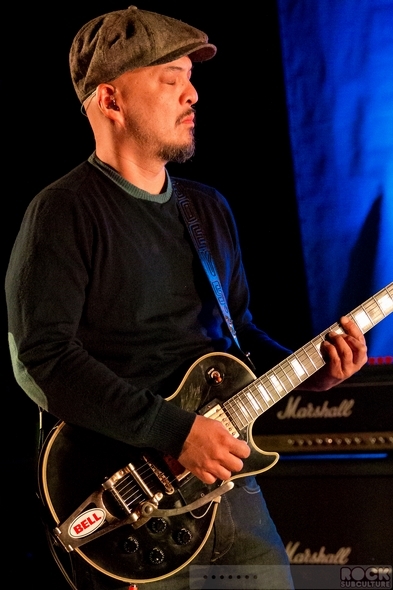 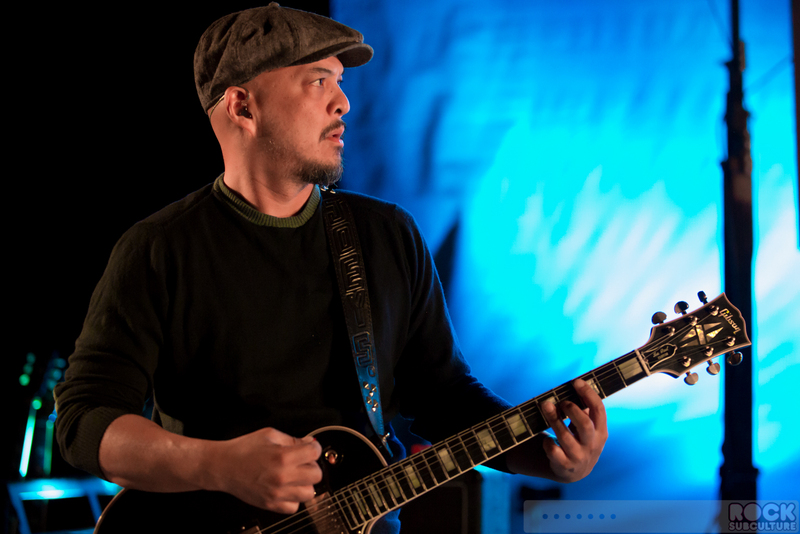 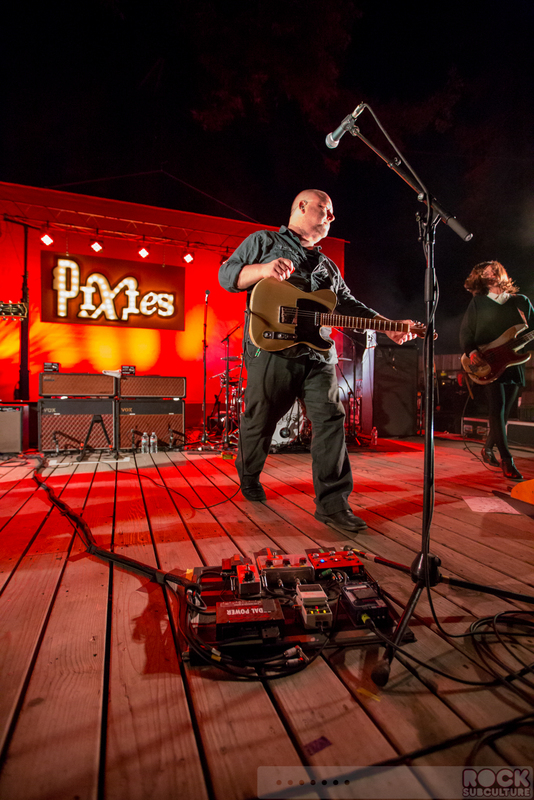 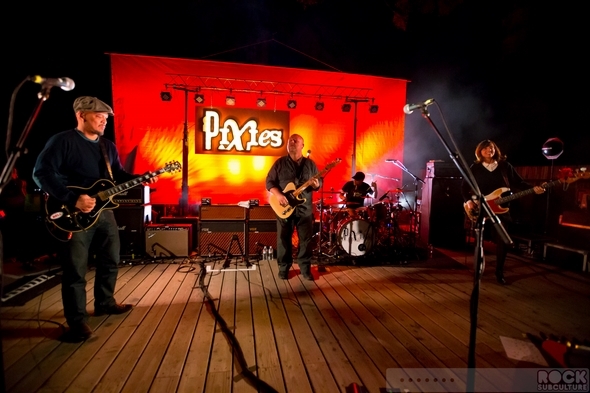 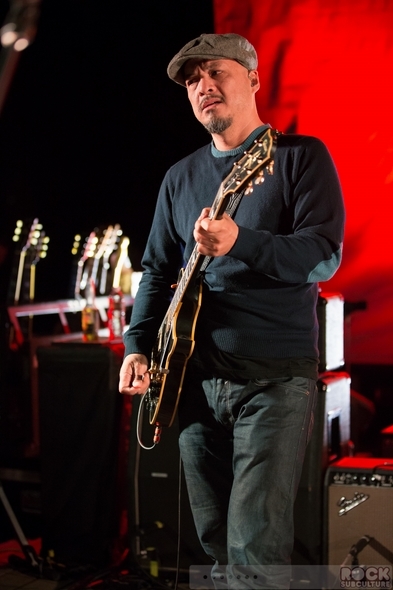 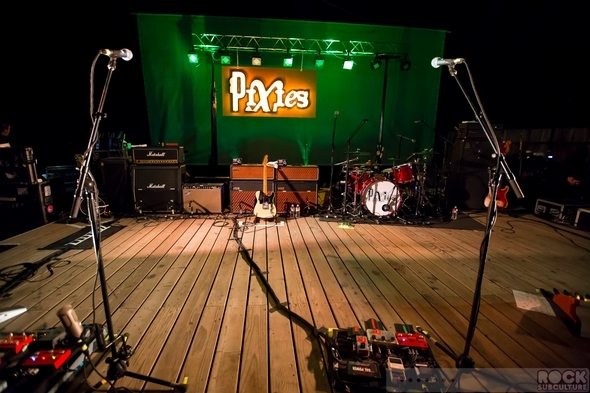 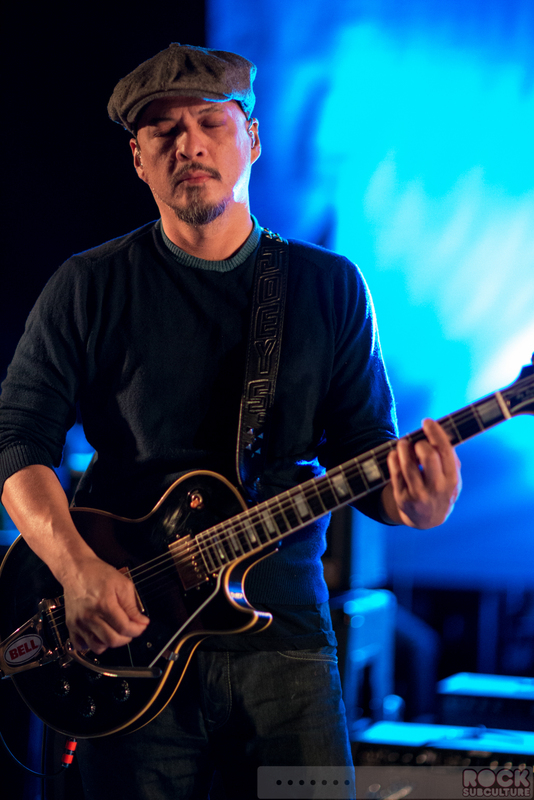 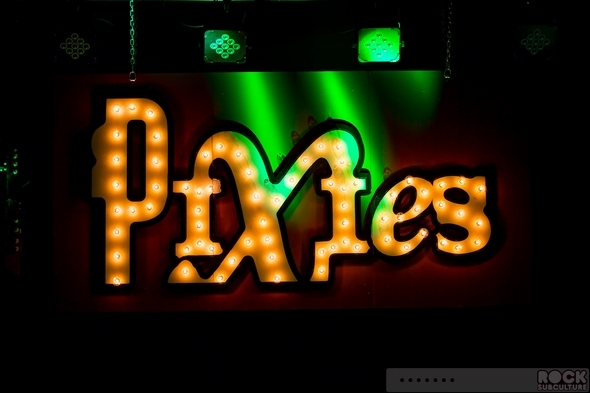 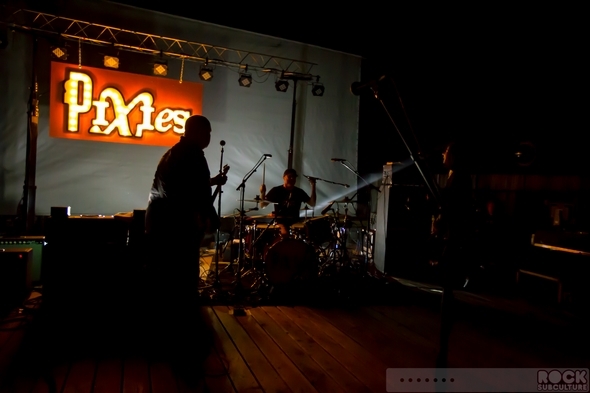 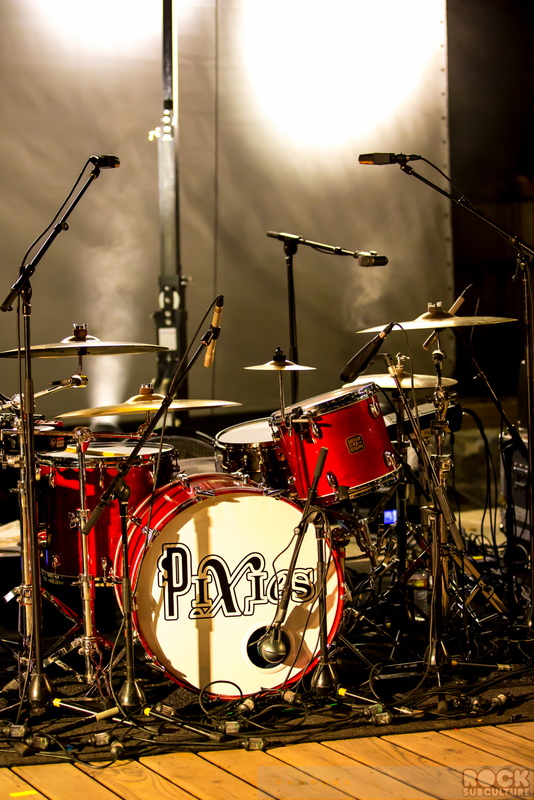 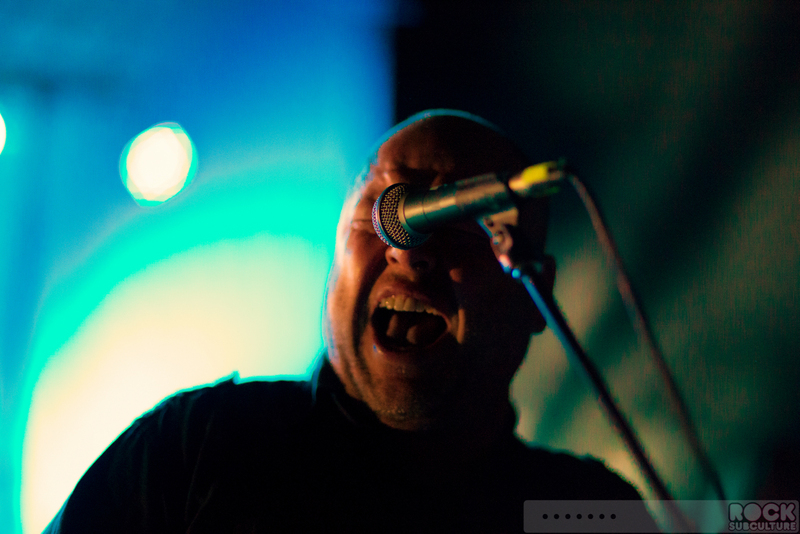 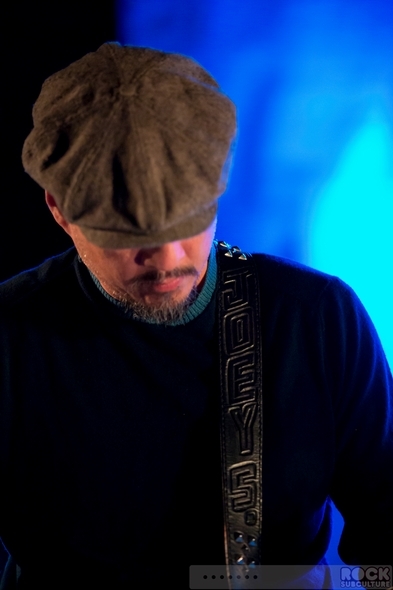 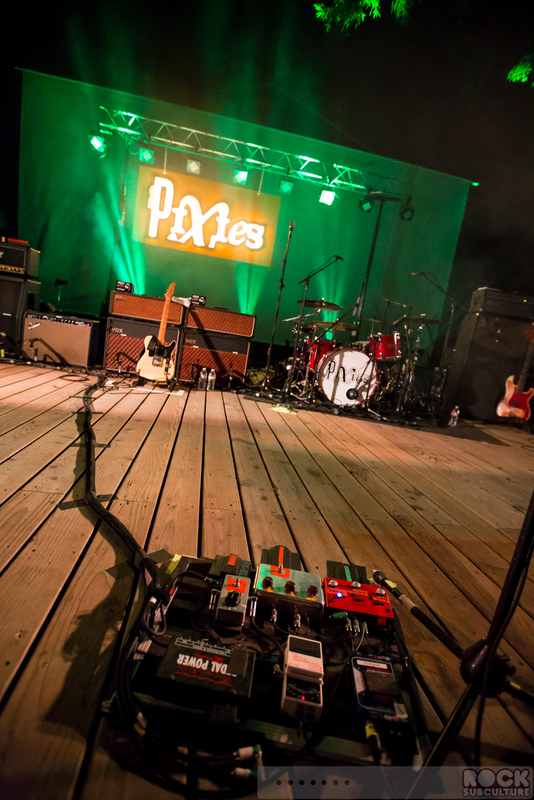 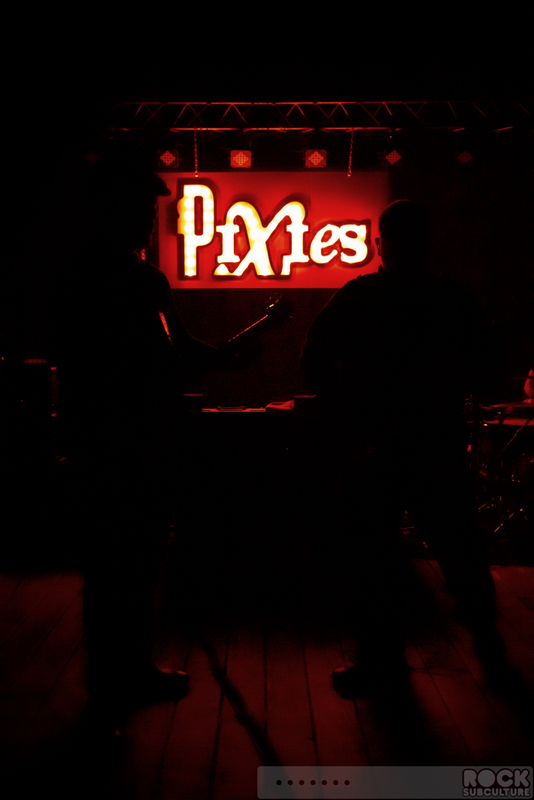 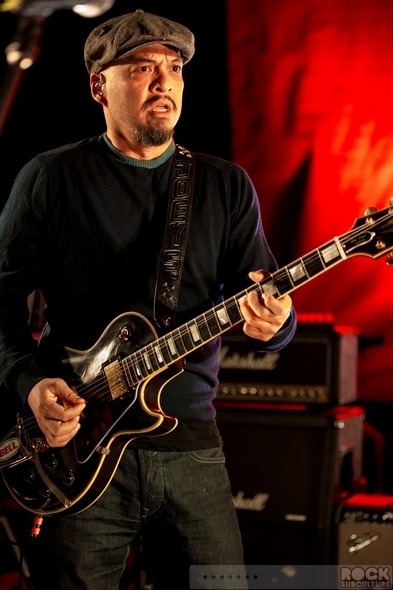 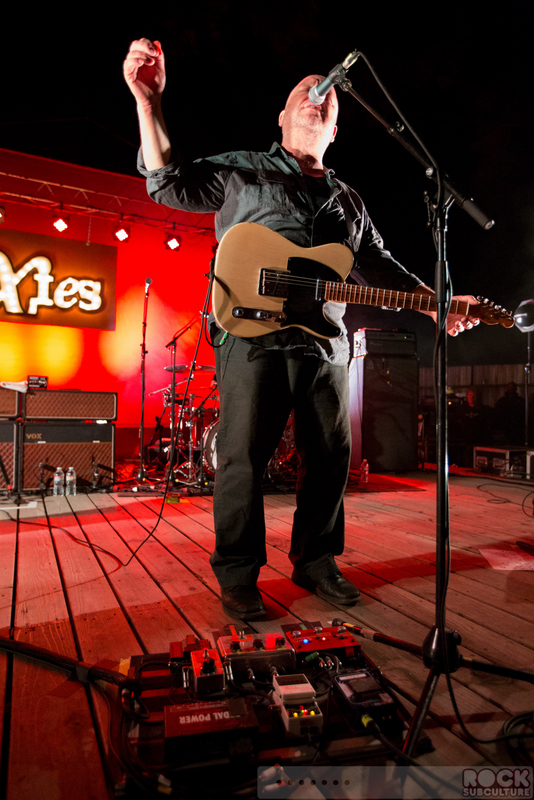 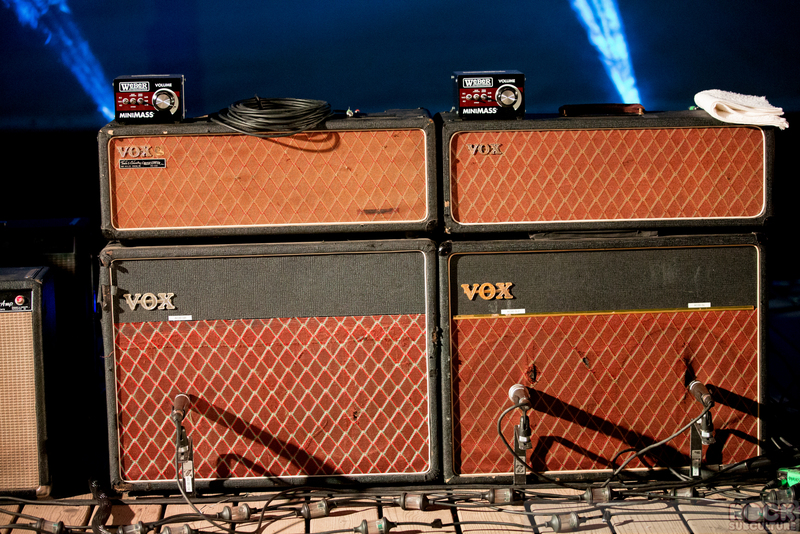 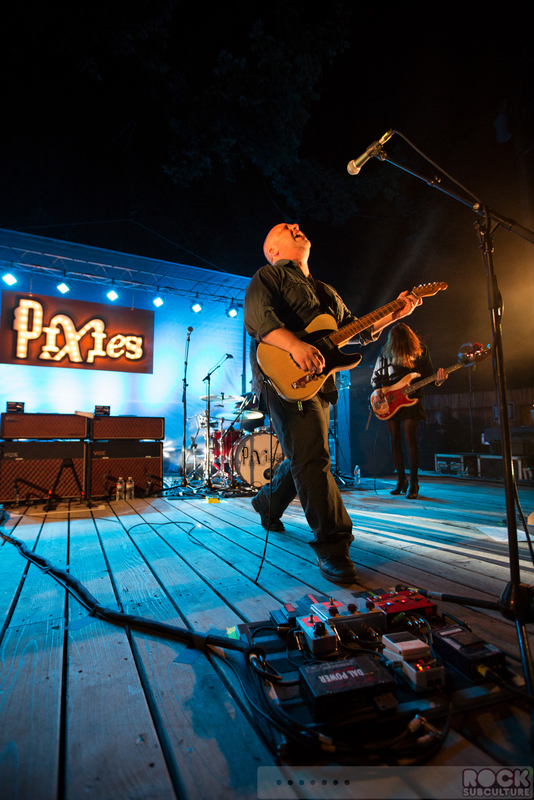 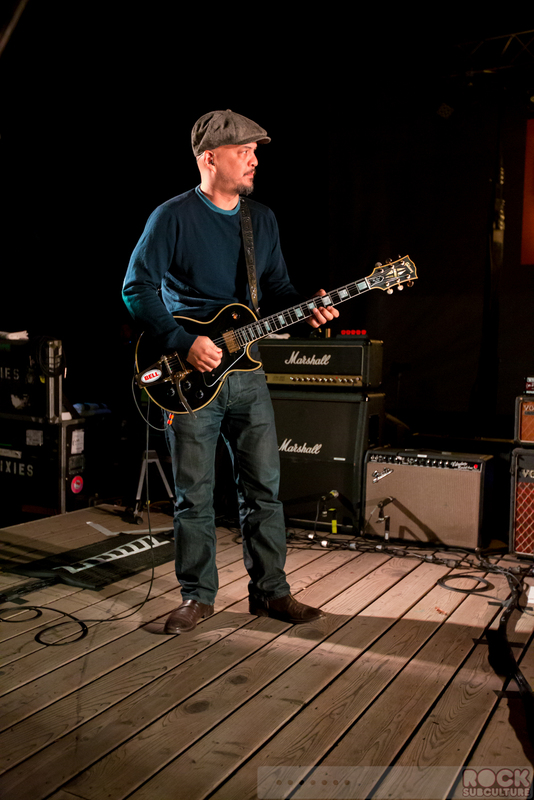 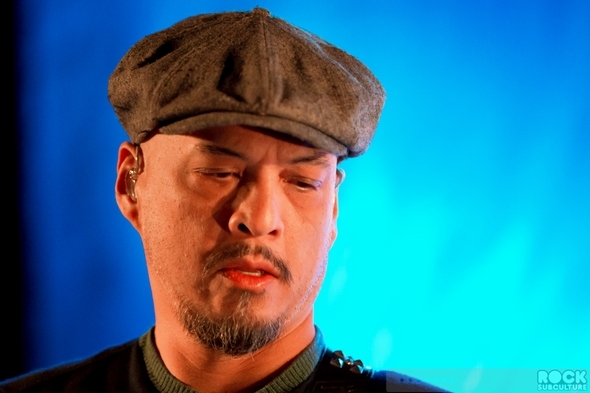 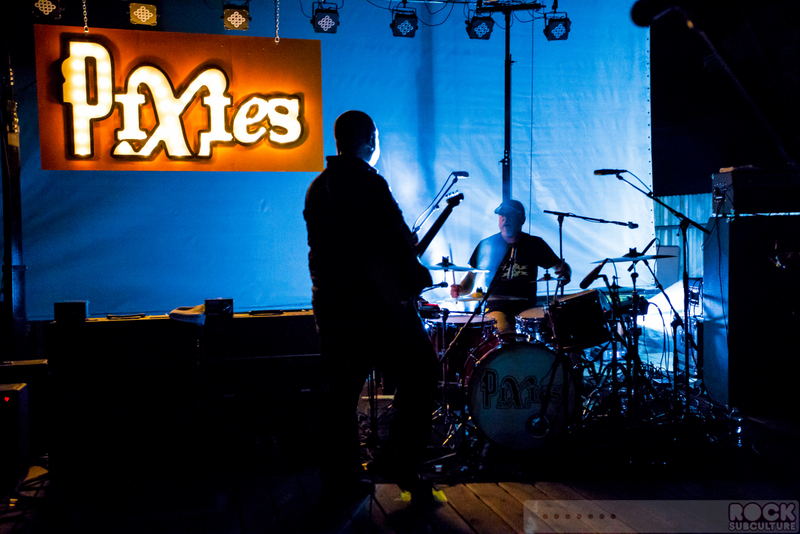 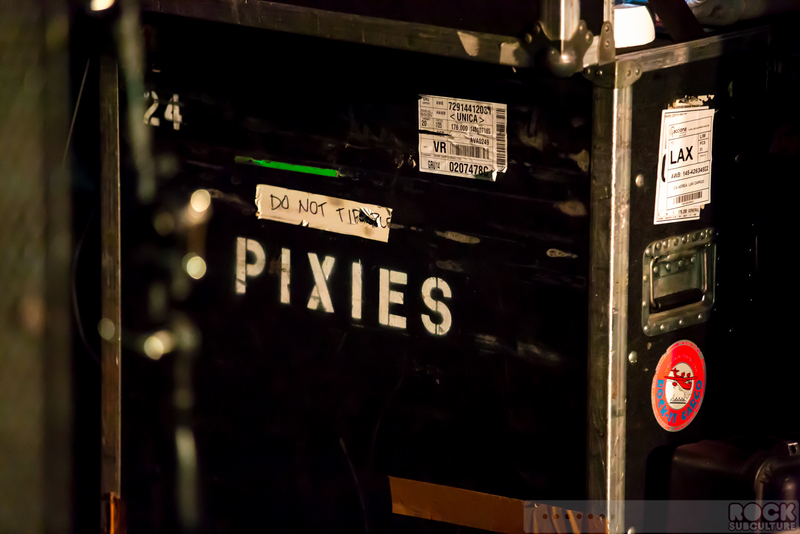 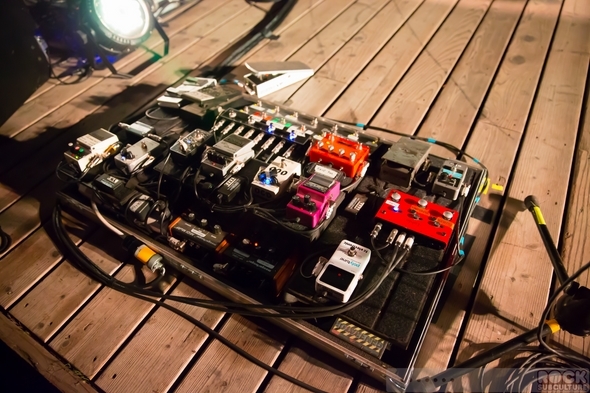 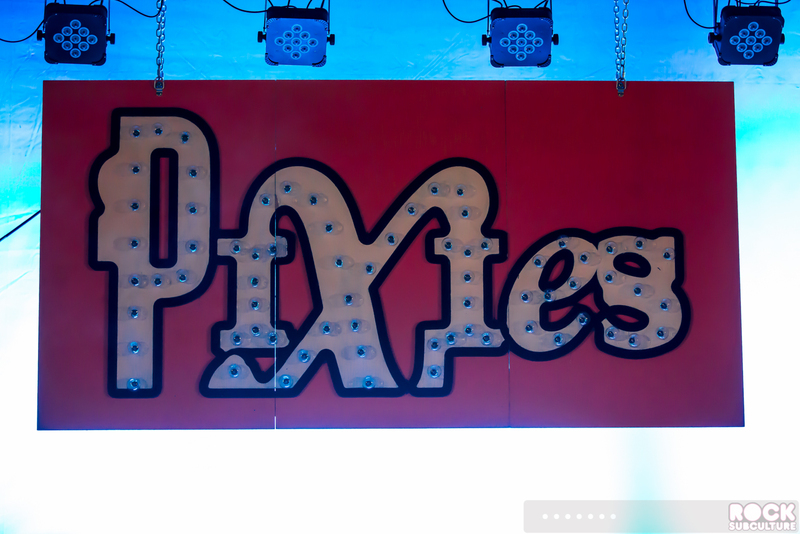 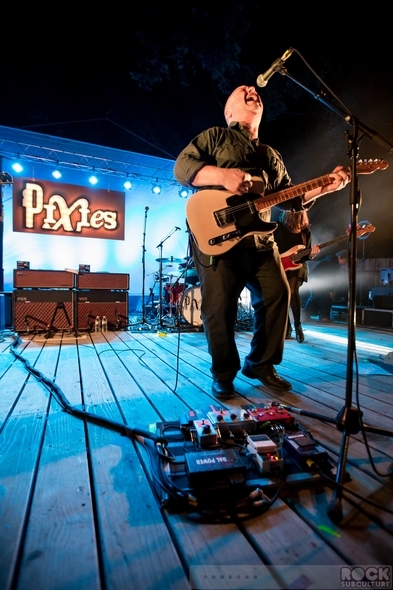 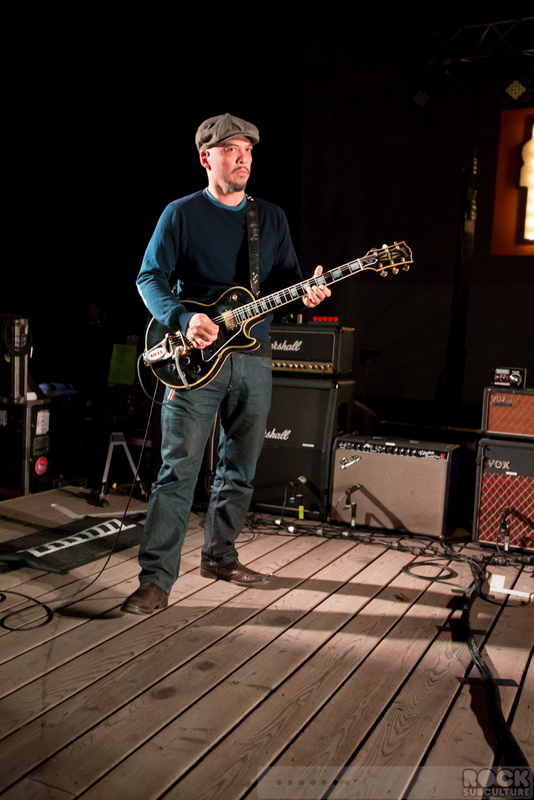 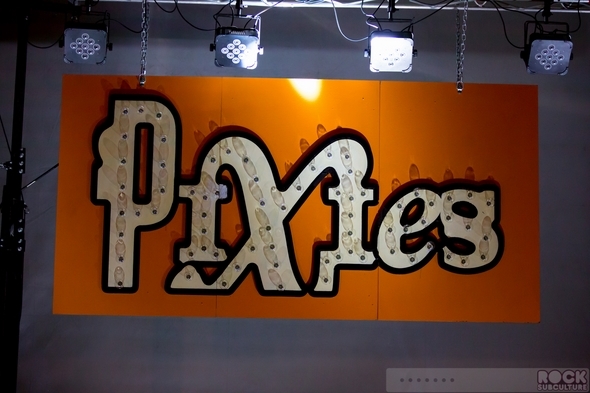 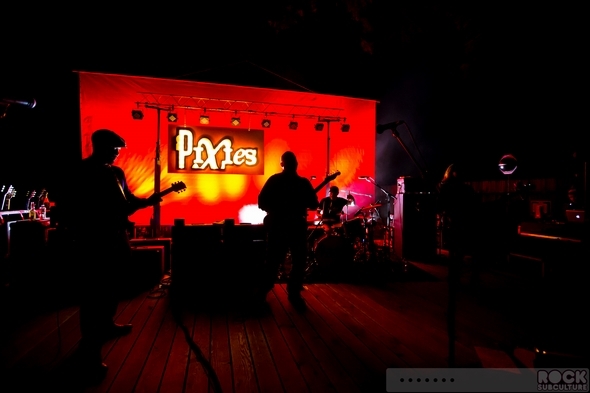 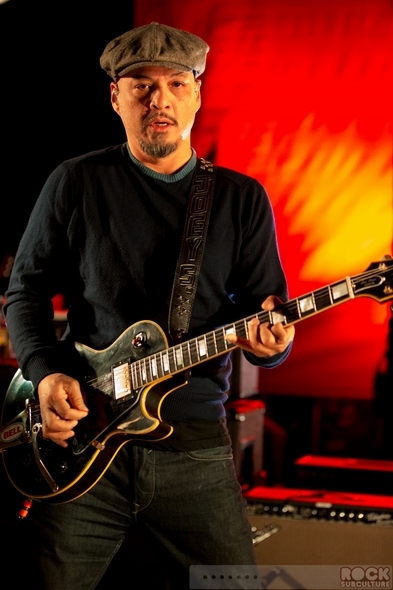 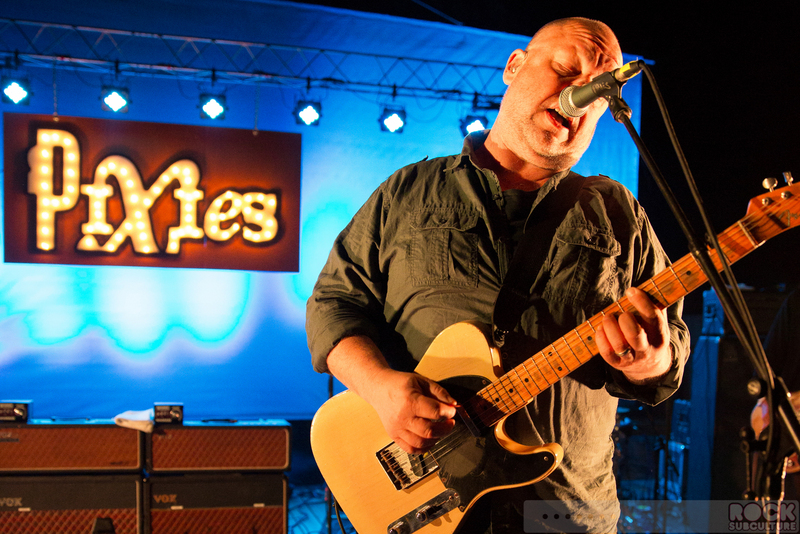 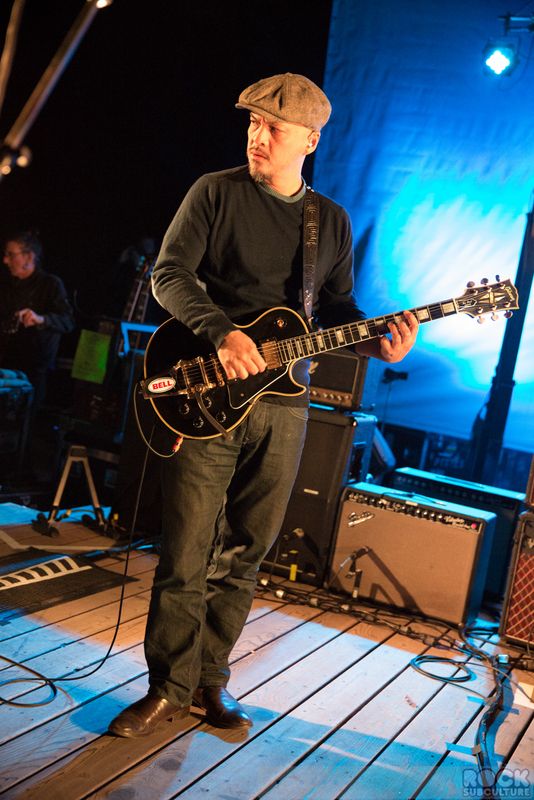 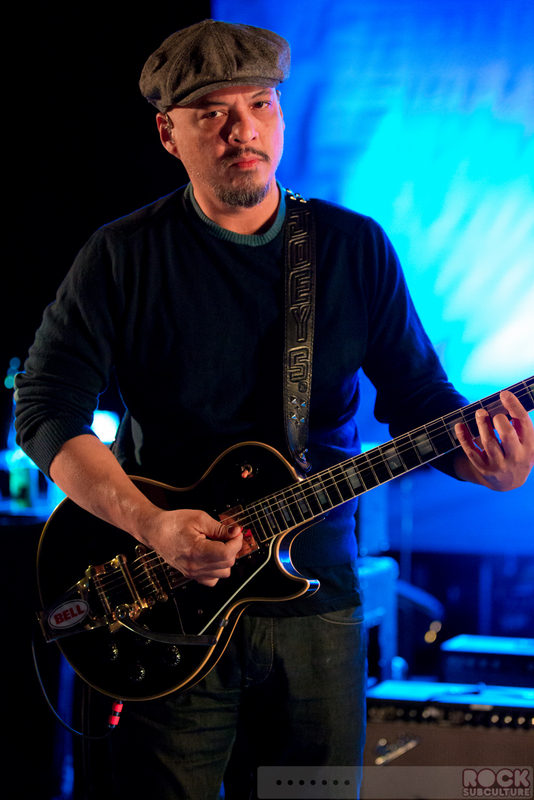 It is certainly an exciting time to be a Pixies fan. And with that, they appear to not only be cultivating their existing fan base but creating new generations of fans, some who were not even alive back in their heyday. 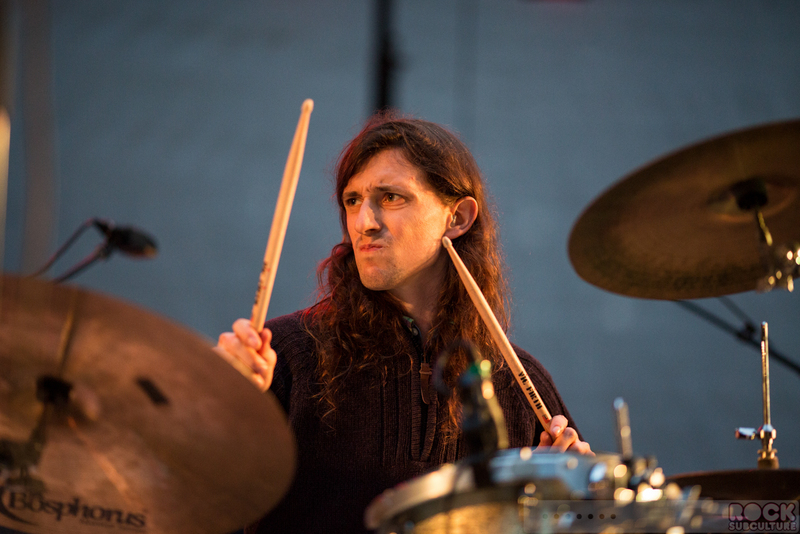 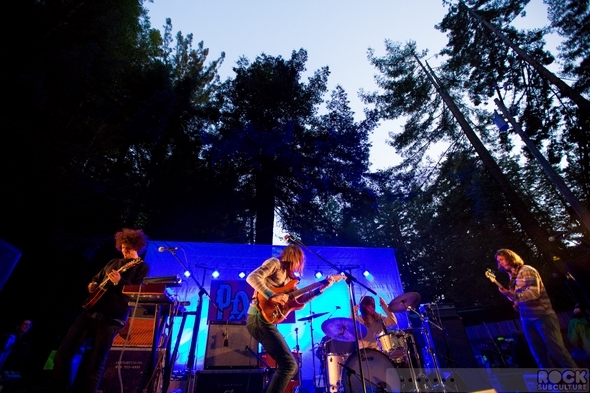 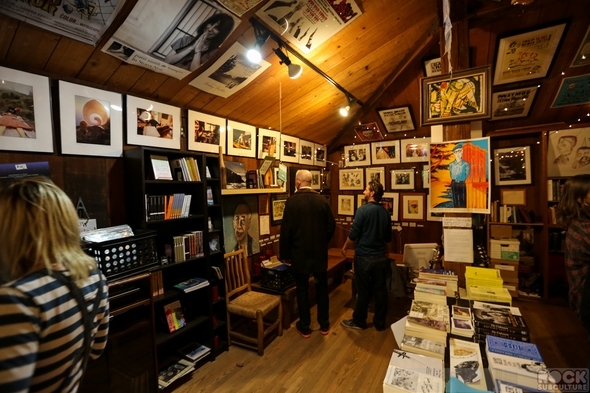 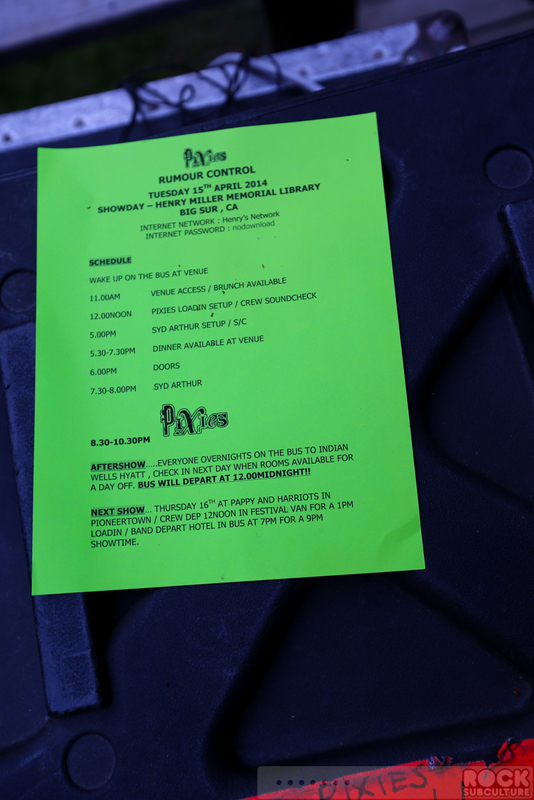 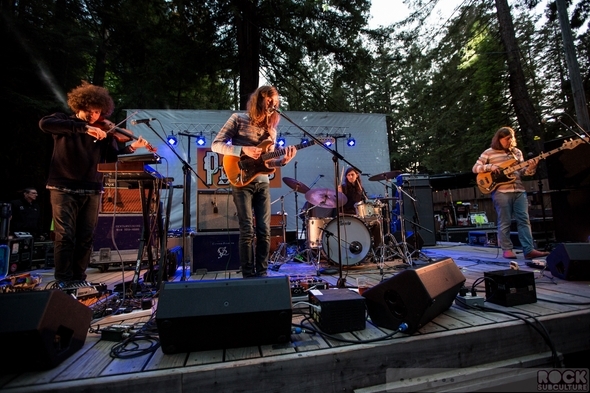 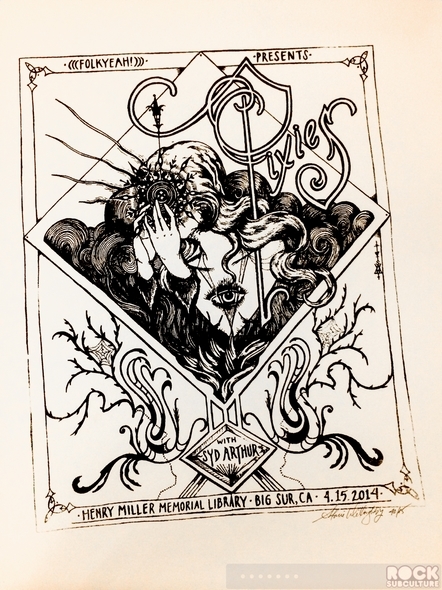 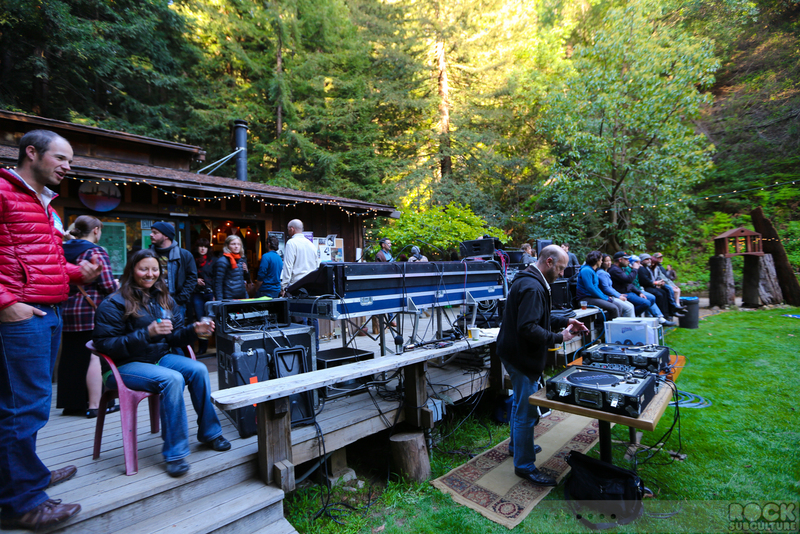 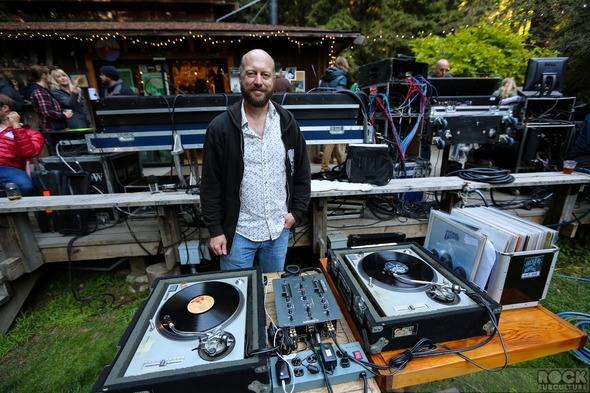 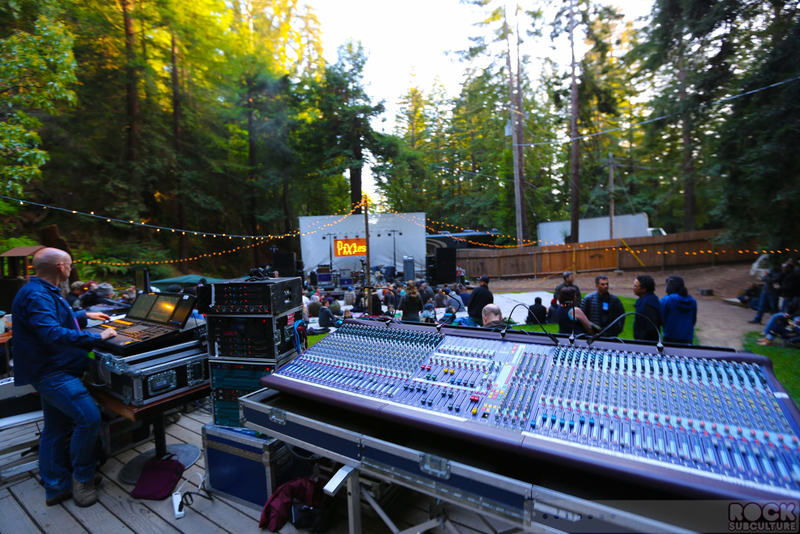 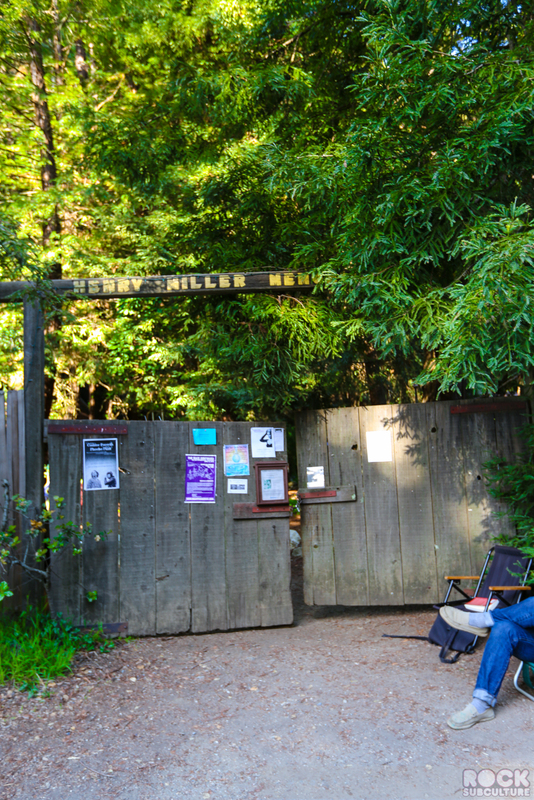 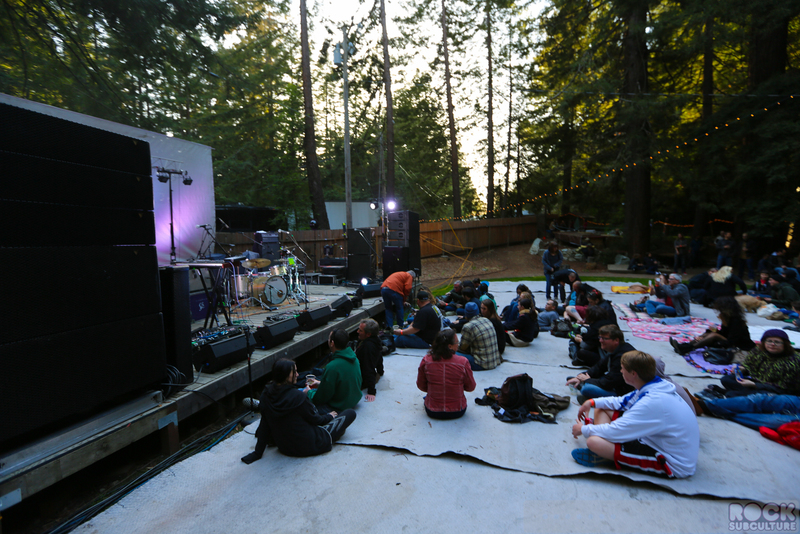 They are currently in a phase of touring overseas, but are in California for Coachella, and thus added this very special date at Henry Miller Memorial Library in Big Sur (as well as a show at Pappy and Harriet’s in Pioneertown). 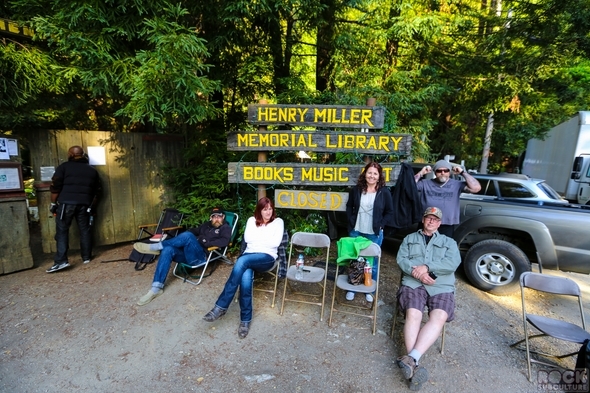 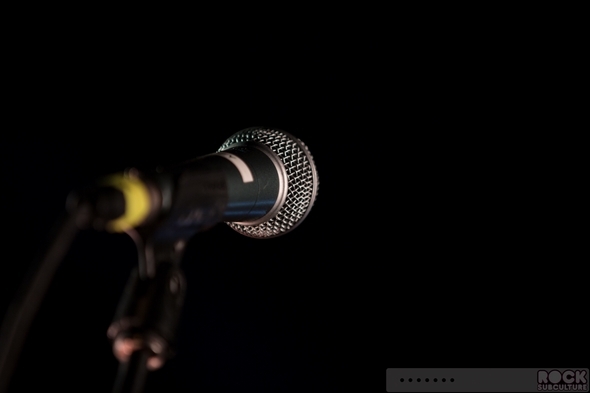 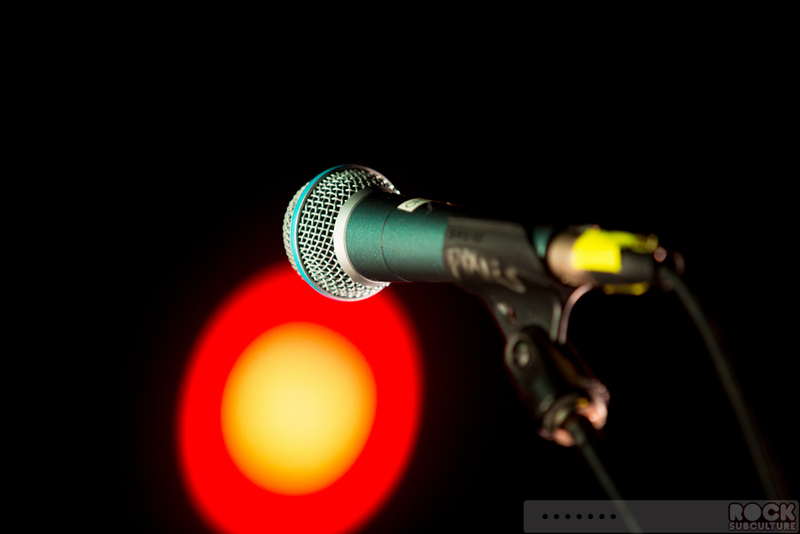 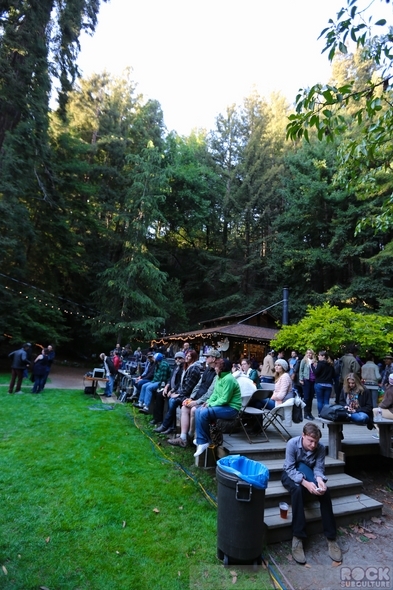 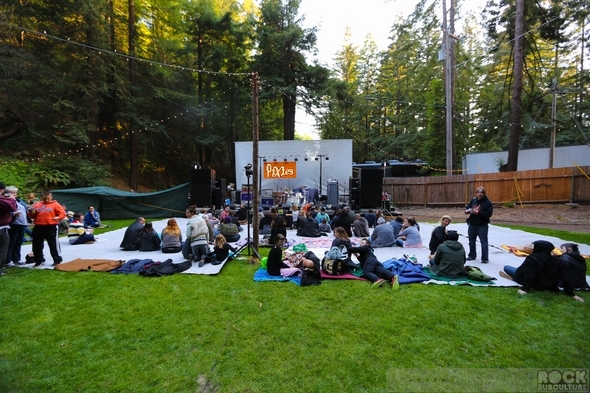 The Henry Miller show sold out instantly, as the venue only accommodates 300 fans. 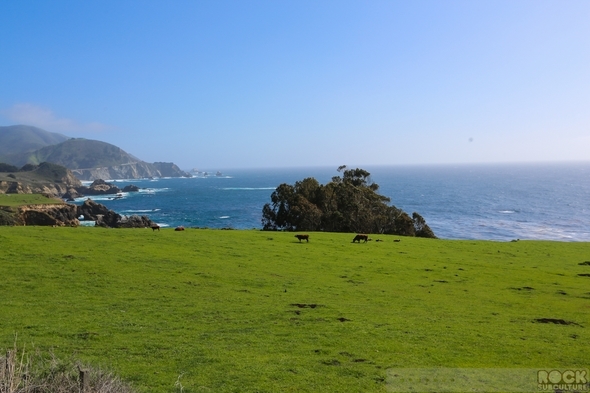 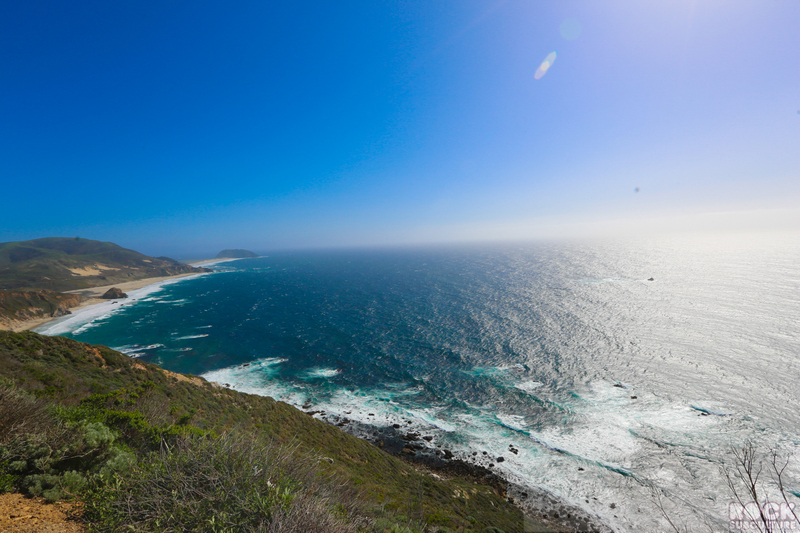 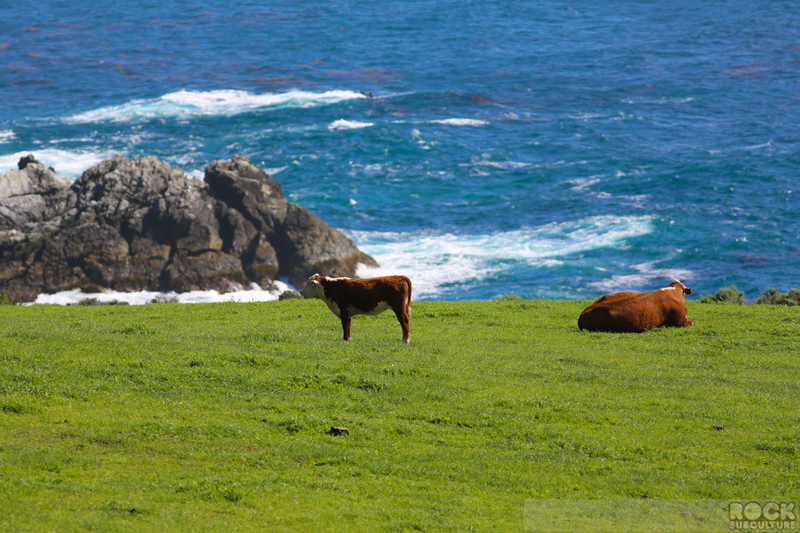 Big Sur boasts one of the most beautiful coastlines in all of California (maybe the most beautiful), as Highway 1 winds up and down the stretch of ocean. I’d never attended a show at Henry Miller Memorial Library, but once I was inside and saw it, I remember that I had stopped to visit it (the library part) many years ago. 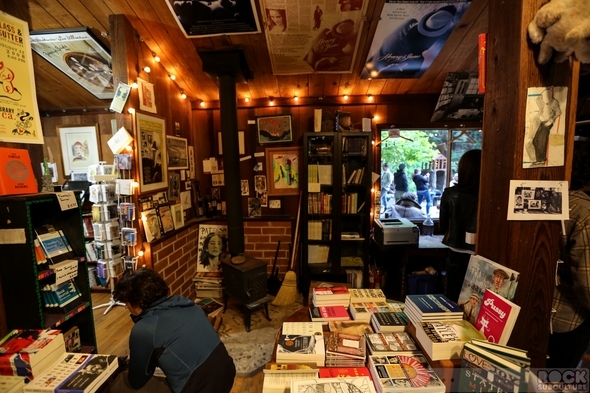 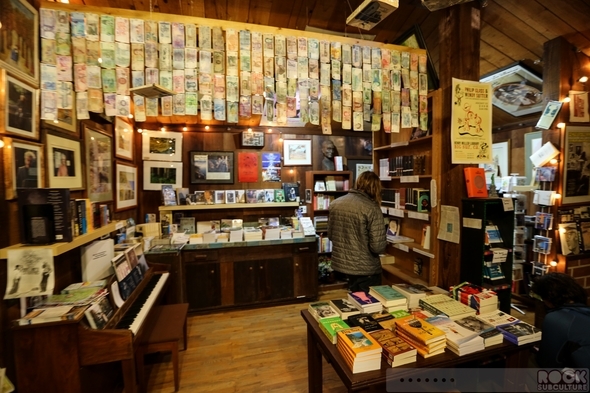 More of a small shack of a bookstore than what one might imagine when hearing the word “library”, it is located in a gorgeous grove of trees and what you might loosely call “nature”, which is a vast understatement. I arrived at about 4:30 for the 6:00 doors show, and there were maybe half a dozen people in line (and kudos to the venue for providing chairs – a first for me!). 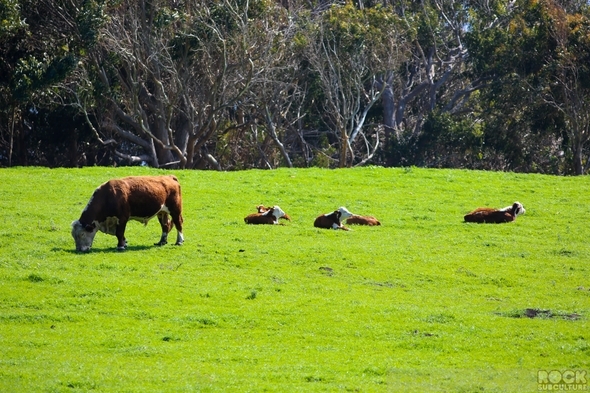 Those there said that they’d arrived about a half an hour earlier. 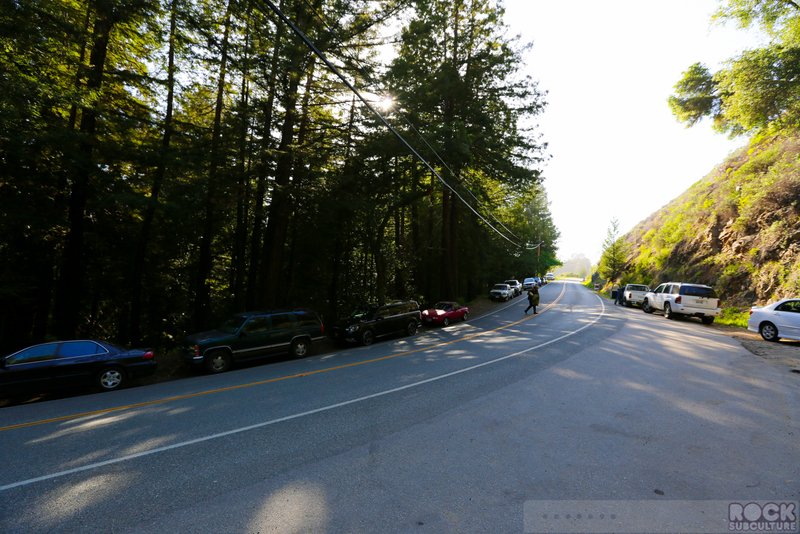 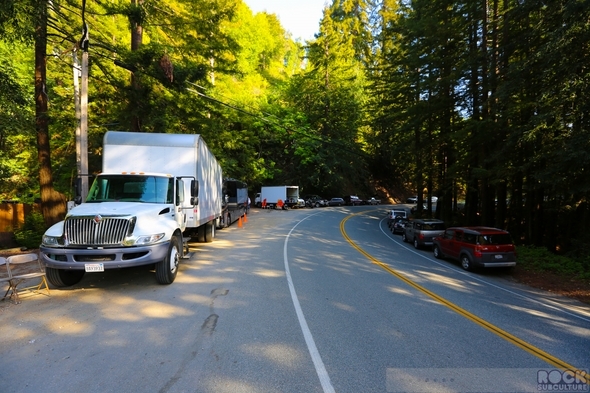 I found parking along the side of the road, directly across the street, and all of the activity (and waiting) was literally roadside. It was only after I’d been waiting for a little while that I noticed that the stage and such was just on the other side of a humble fence, and realized just then how small of a show it was really going to be. The event was expertly organized by a very friendly group of people, and I can’t recommend enough turning out for a show at this special venue, as it was very unique (and awesome in all the ways it was different from the typical concert venue). 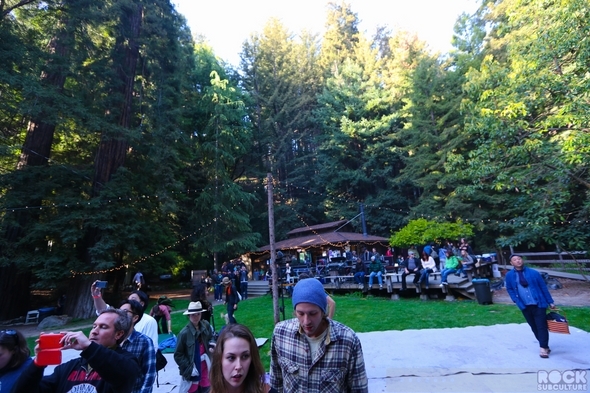 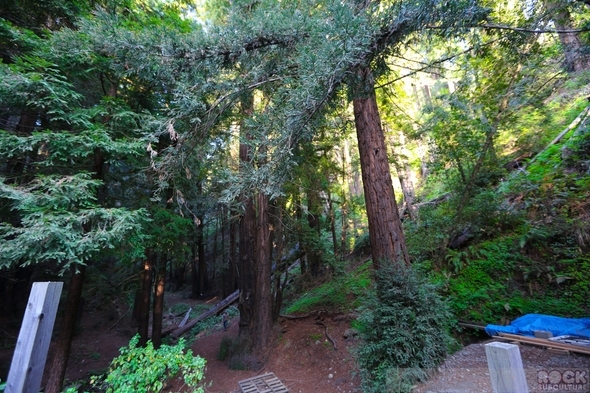 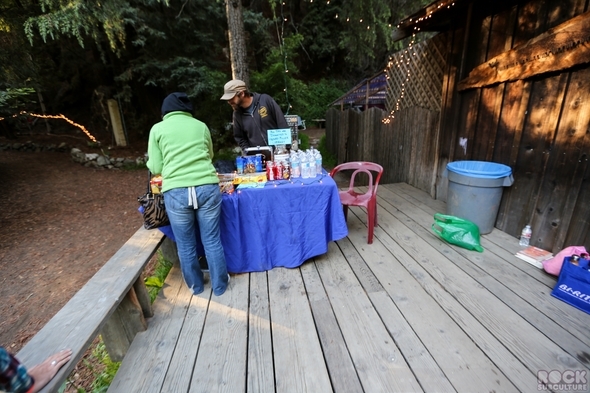 Surrounded by trees, there were ample places to sit, get drinks and food, peruse the library, etc. The stage itself was simple, small, and low to the ground (raised maybe two feet, if that). 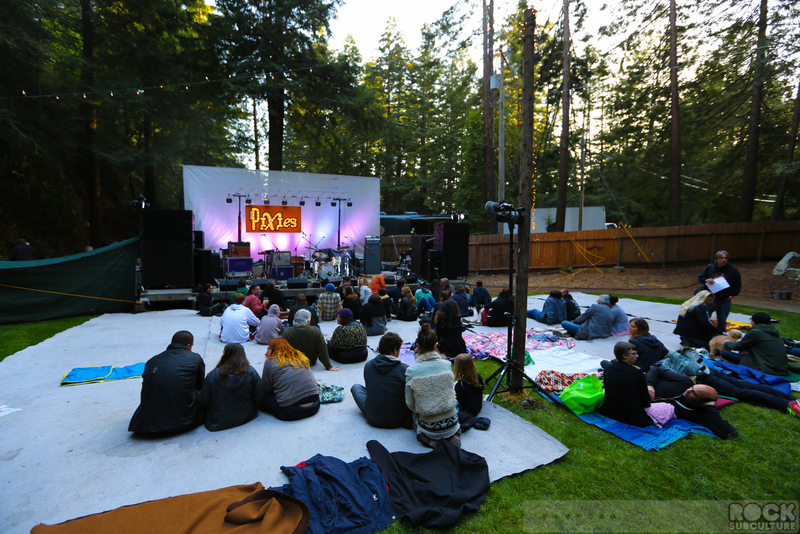 Large mats were neatly lined up all across the area in front of the stage, over the grass, allowing people the opportunity to sit and relax in some comfort. Totally different experience from any show I’ve ever been to before. Awesome crowd – very friendly, happy, and mellow. 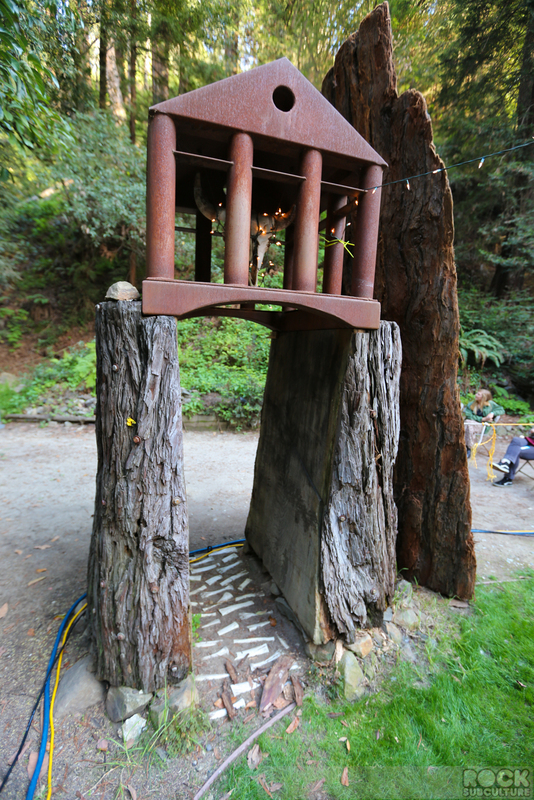 As the sun went down, the filtered sunlight whisked away, and though temperatures dropped, it never really got cold, but was quite comfortable, as we were in a bit of a nature grove and alcove. 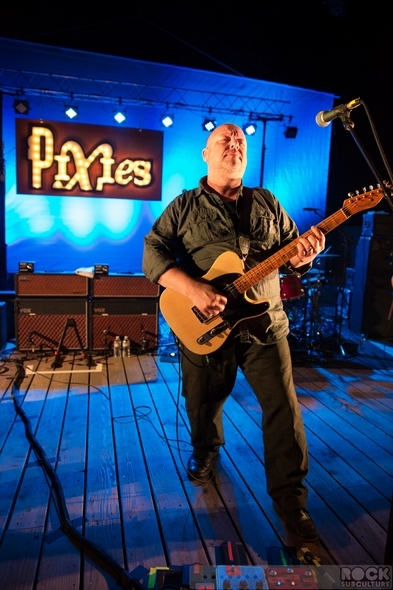 The opener, Syd Arthur, came on at 7:30 and ran about 30 minutes, with Pixies coming on at 8:30 and running about an hour and forty minutes. 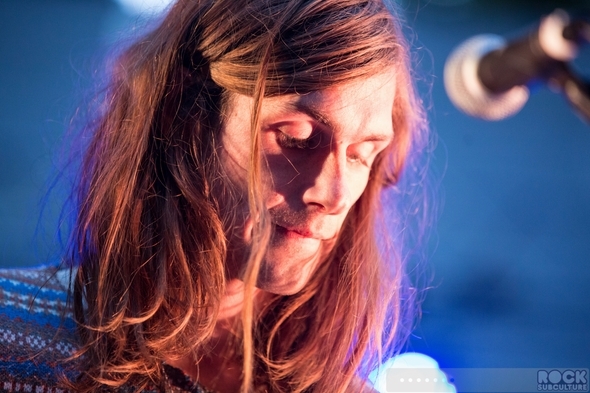 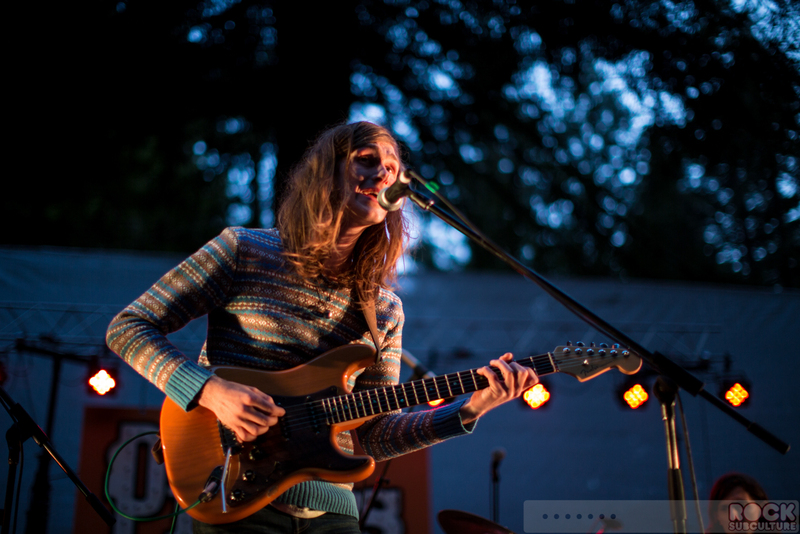 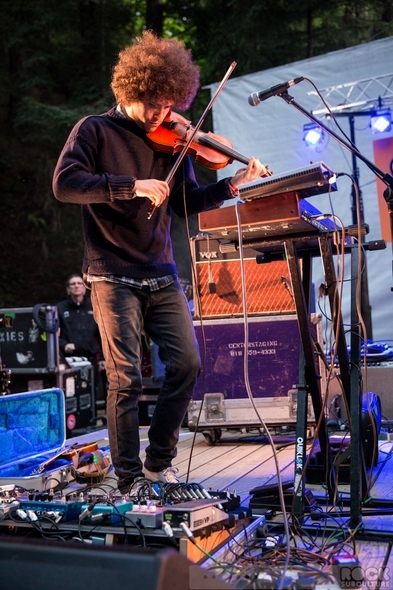 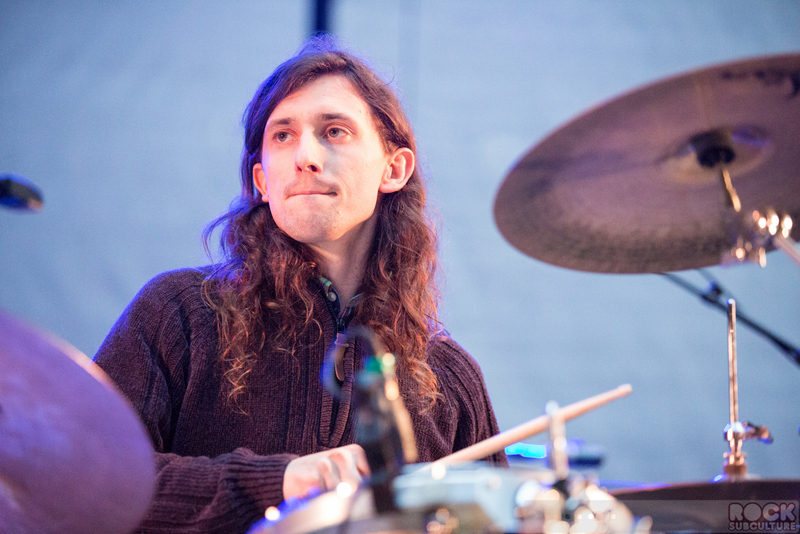 Syd Arthur are a four piece band from Canterbury and the South East of England. 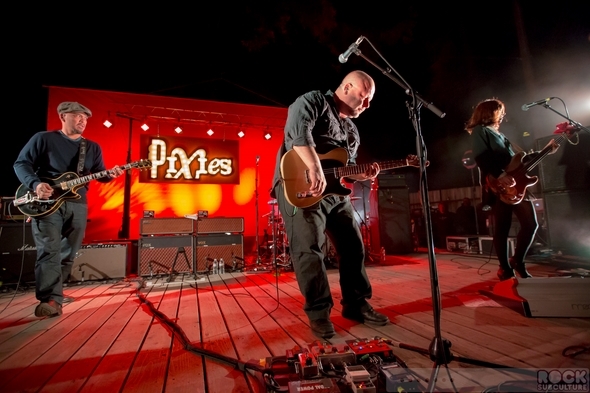 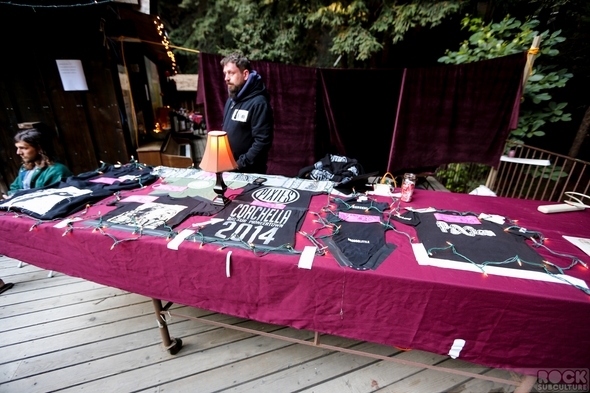 Like the Pixies, they are playing both weekends of Coachella. 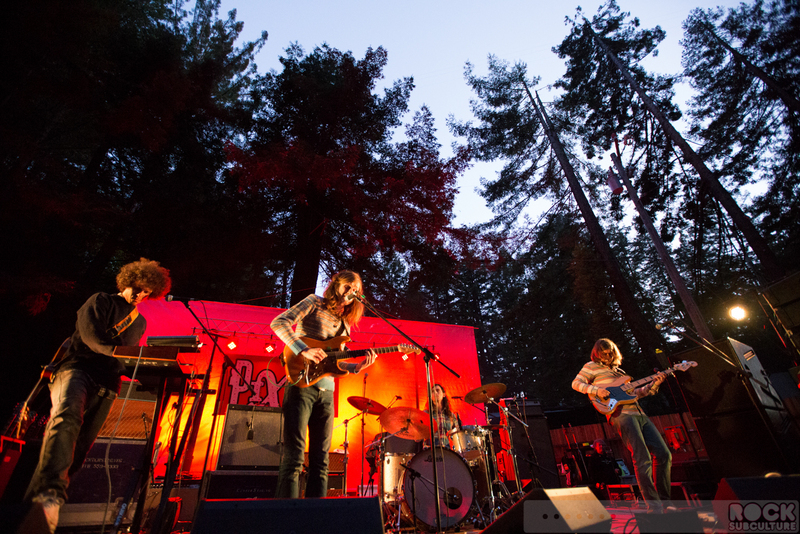 I did not know anything about them prior to the show, but they have a kind of lo-fi appeal with their music, with a bit of a throw back to more progressive and psychedelic rock. 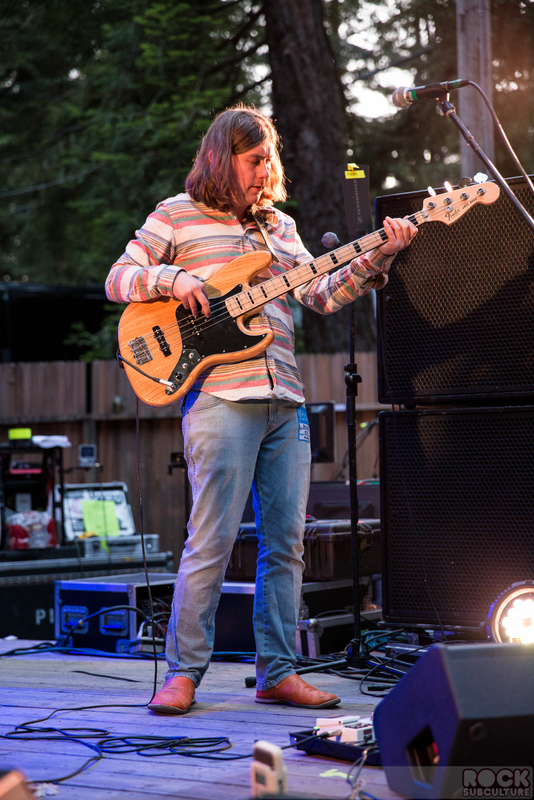 I thought it was kind of strange that the audience elected to sit their set out (in spite of my friend, Nick, trying to set an example early on), and Liam at one point even remarked on that being weird. 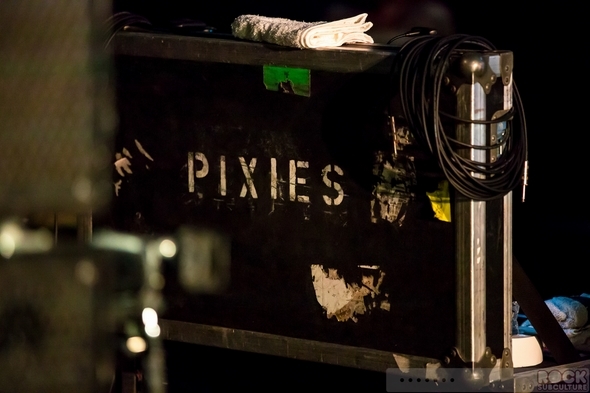 It was an enjoyable warm up to the main event, and a great pairing for the Pixies. 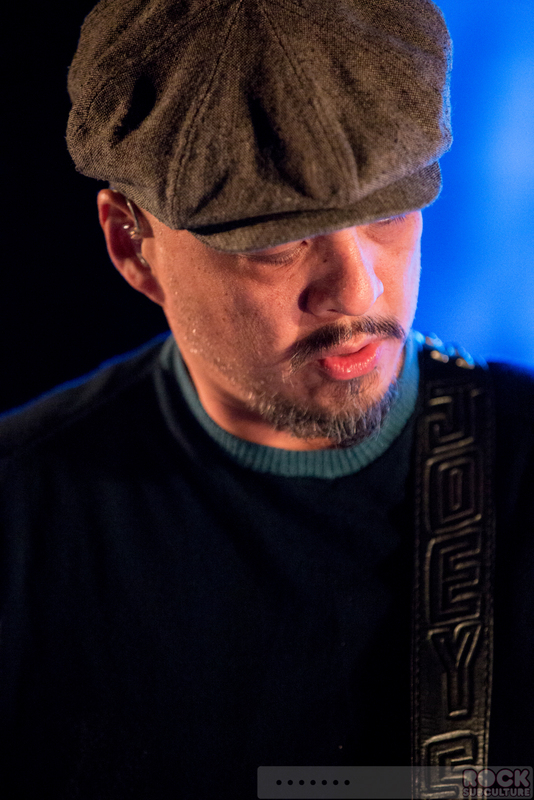 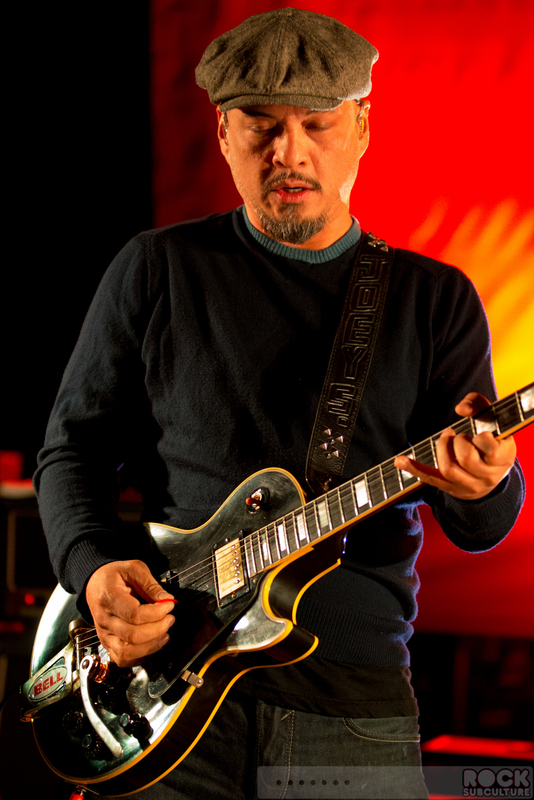 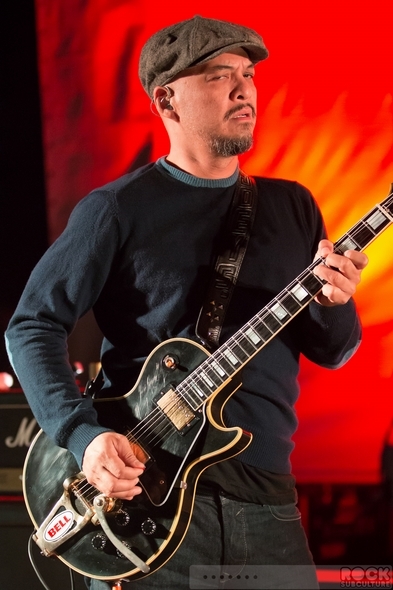 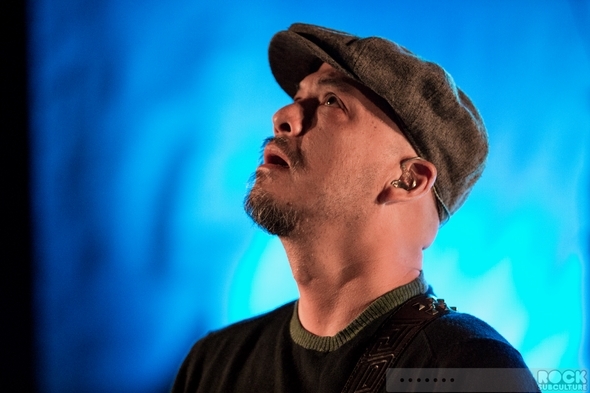 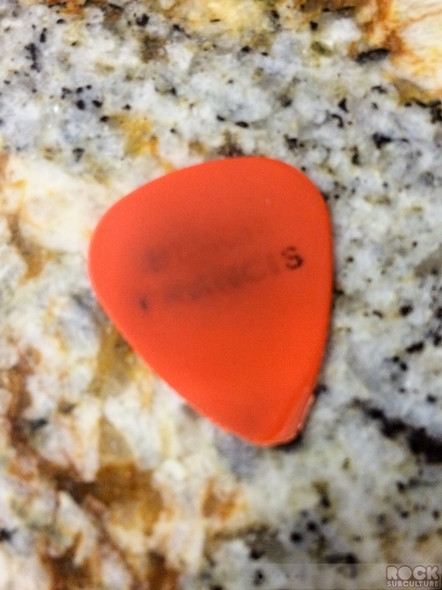 I was lucky enough to see two of the Pixies concerts in Los Angeles back in September, as well as the one at Fox Theater in Oakland a few months ago, so this review is somewhat of an ongoing update the prior ones, and I am borrowing some of what I shared earlier here, along with new thoughts and observations. 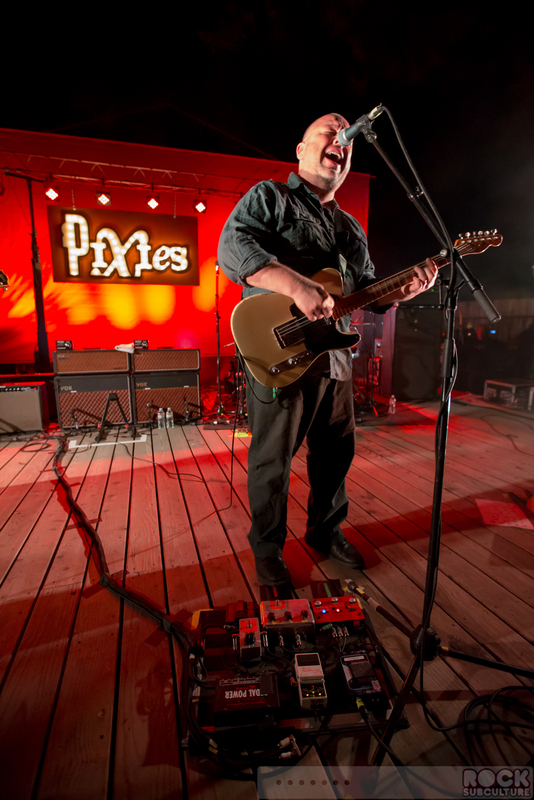 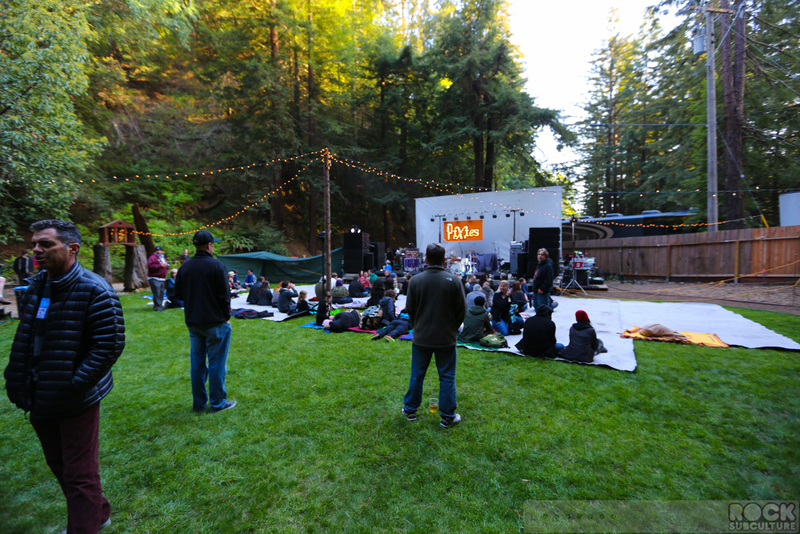 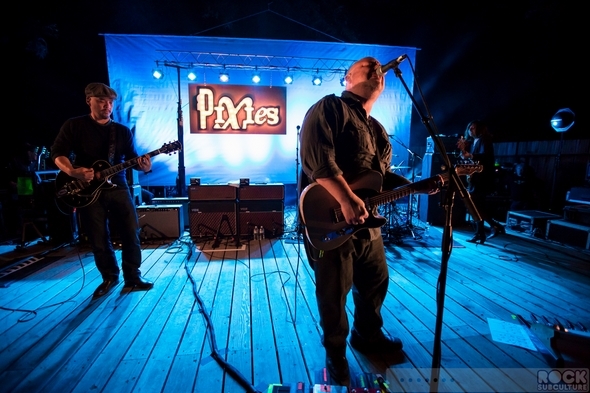 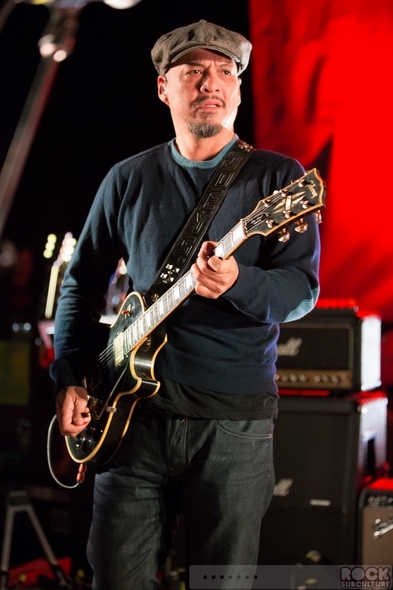 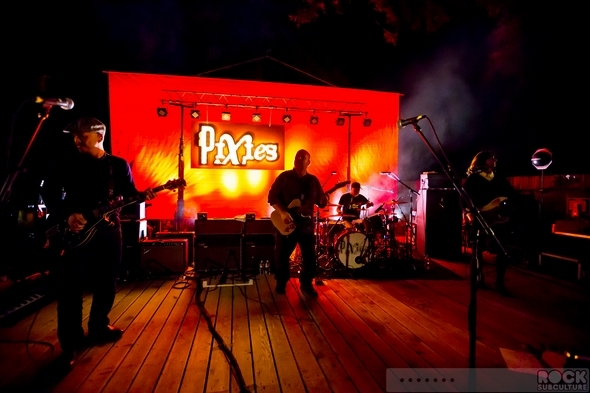 As with the LA shows in September, and this year in Oakland, and now this special show in Big Sur, the crowd turning out for these concerts is a mix of all ages, but including a lot of young people who realize what a huge impact (and an important one) the Pixies has had on music. Even standing up front at Henry Miller Memorial Library on Tuesday night, a 24 year old next to me was quoting Kurt Cobain and his comment about Pixies influence on Nirvana (and who was copying who). 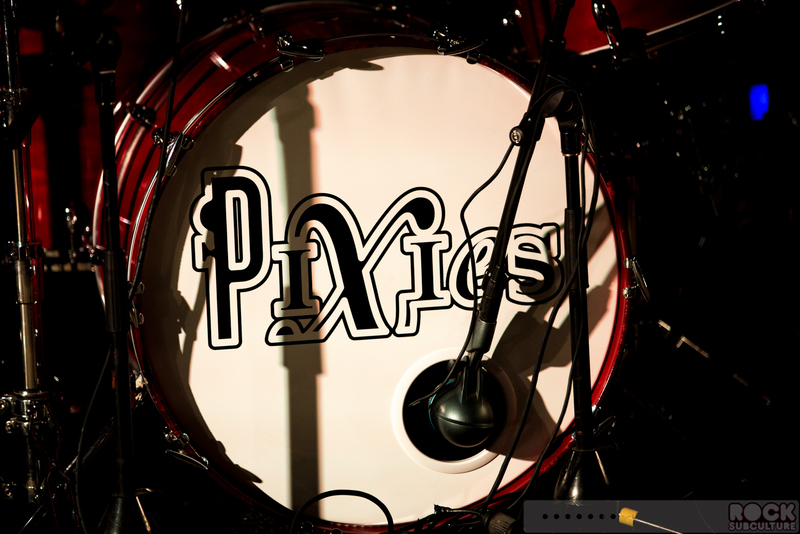 Which is funny, because standing in line at a Black Keys show a few years ago, I was talking to some kids in their early 20s, and brought up Nirvana, which resulted in many blank stares and the comment, “yeah, I think I’ve heard of them…” That really underscores that Pixies fans tend to be much more sophisticated and I guess you could say artist and music history literate when compared with the average fan of contemporary rock and pop music. 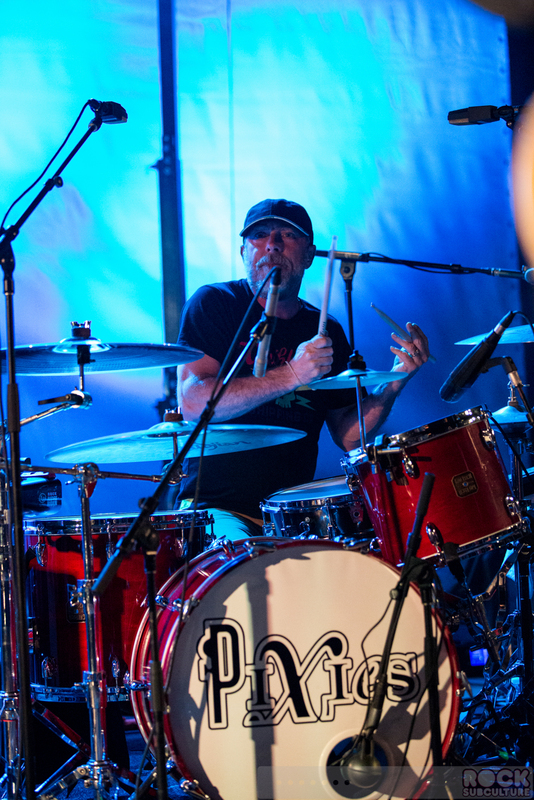 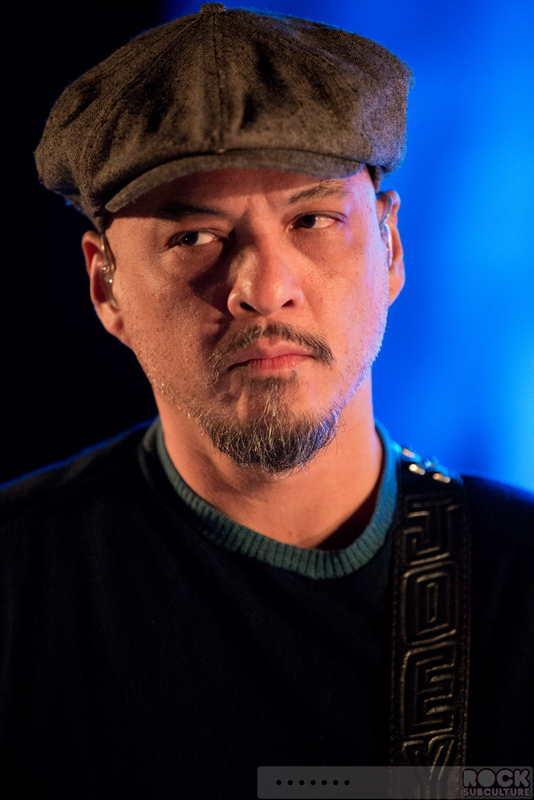 The band released some new material last year with free single “Bagboy” and then their EP-1, which featured four more songs. This year, they put out EP-2 and EP-3, all of which will be collected and released as a new full studio album, Indie Cindy, at the end of the month, on April 28th. 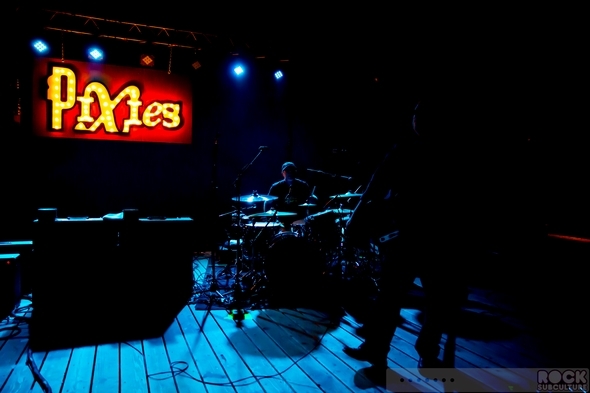 There will be a special deluxe two disc set (as a CD and as a 180-gram vinyl gatefold album) that will include a 13-track live disc and be limited to 3,000 copies, as well as a variety of other formats which you can learn about at www.pixiesmusic.com. 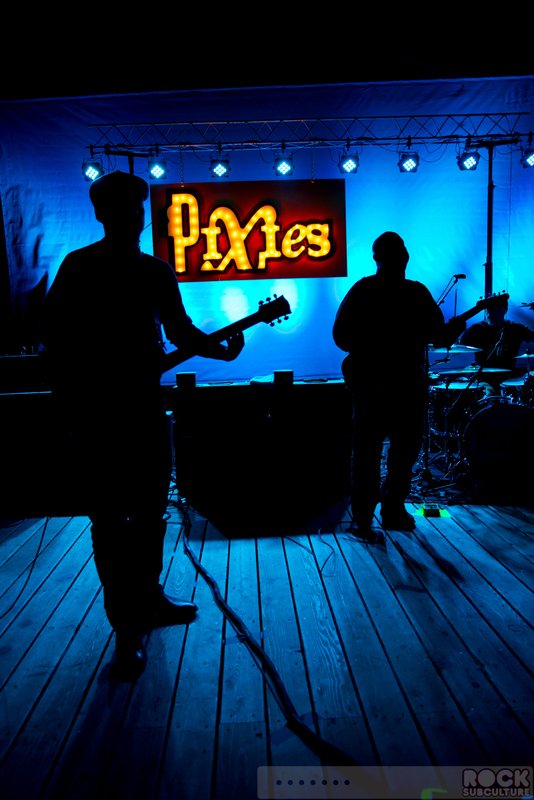 Additionally, on Record Store Day on Saturday a special RSD limited edition vinyl set will be released. It would seem people have at this point lost interest in making a debate about Kim Deal (original bass player and sometimes vocalist and backing vocalist) no longer being part of the band, and at least in the live setting, they seem a bit more harmonious (at least that is what I pick up on, though obviously this is a completely subjective observation). 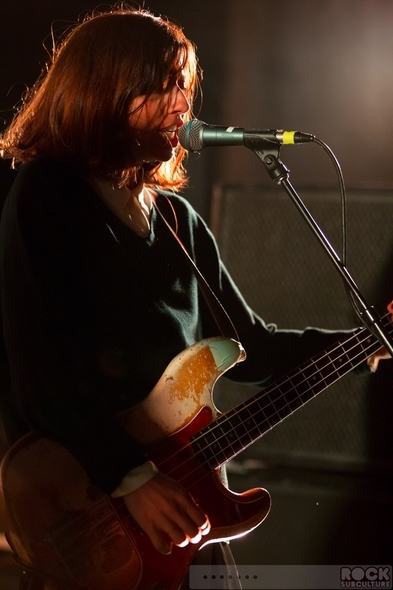 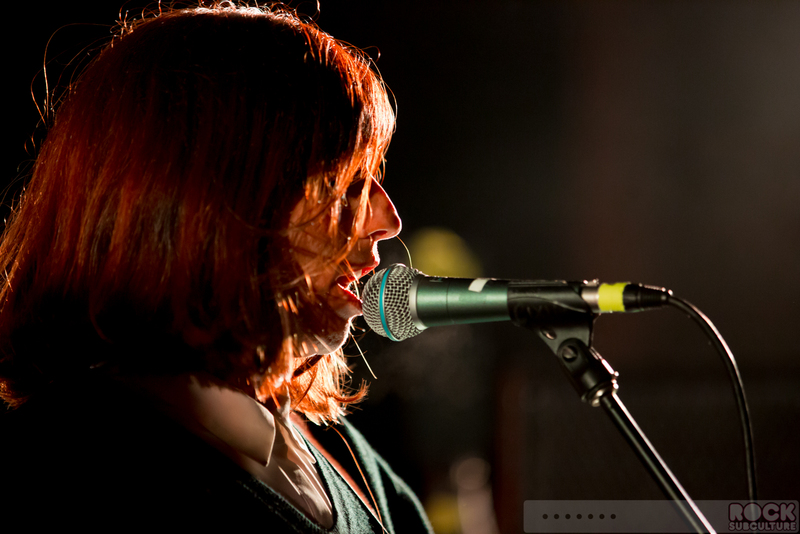 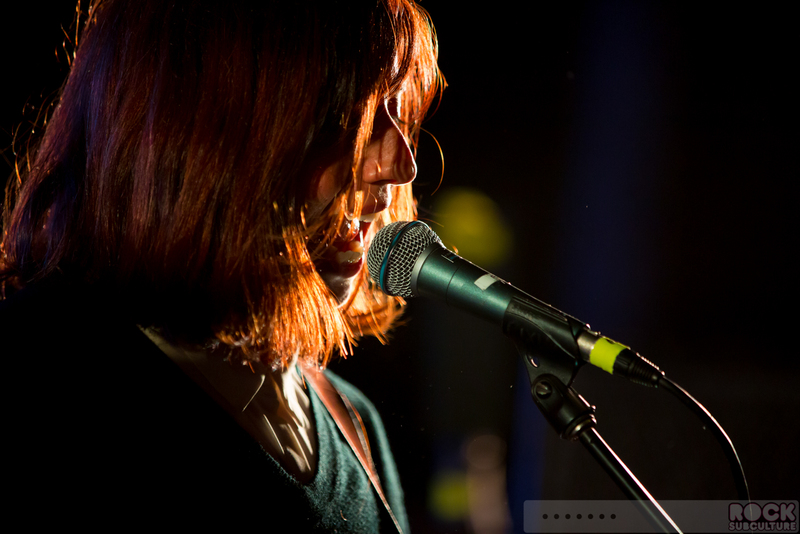 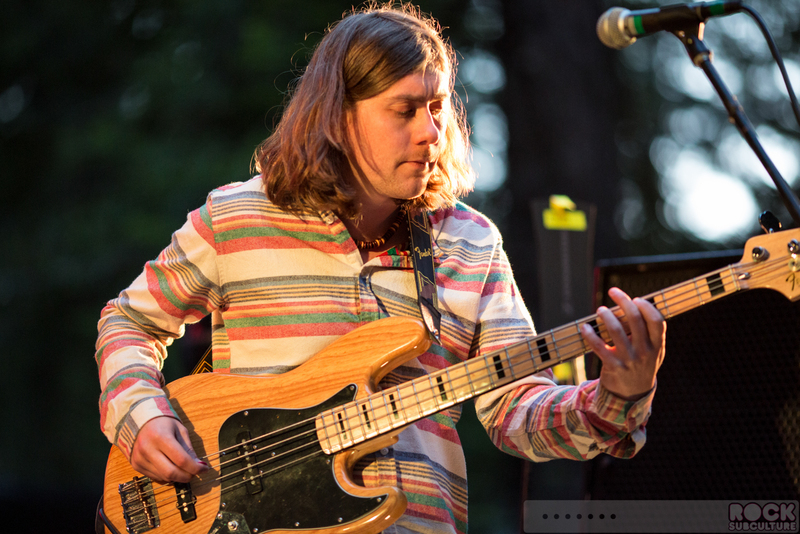 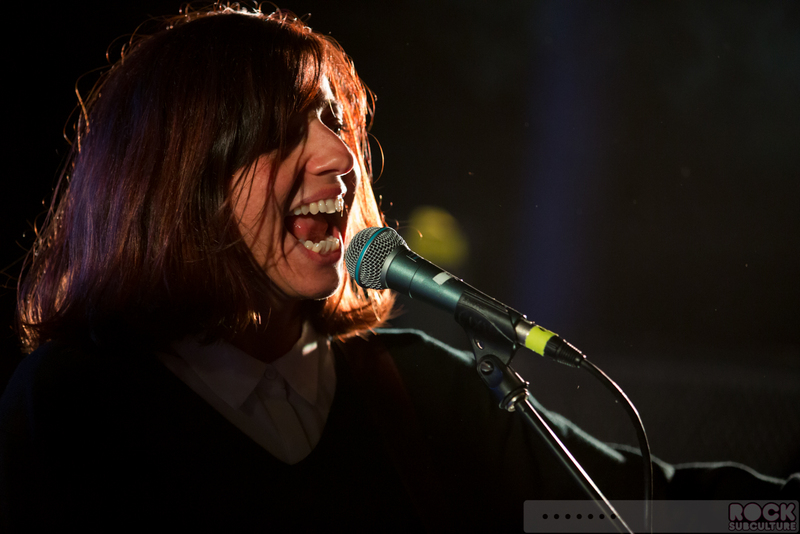 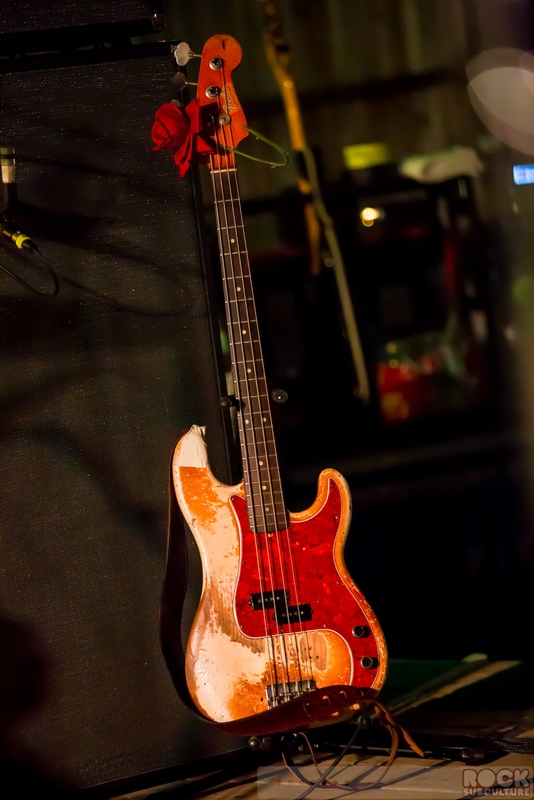 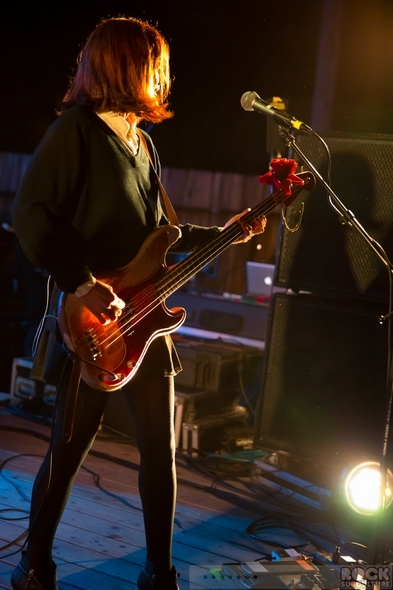 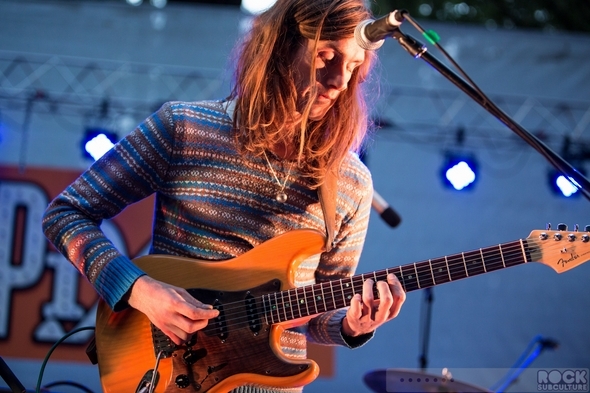 With this current world tour Paz Lenchantin is filling their role for the touring bassist. 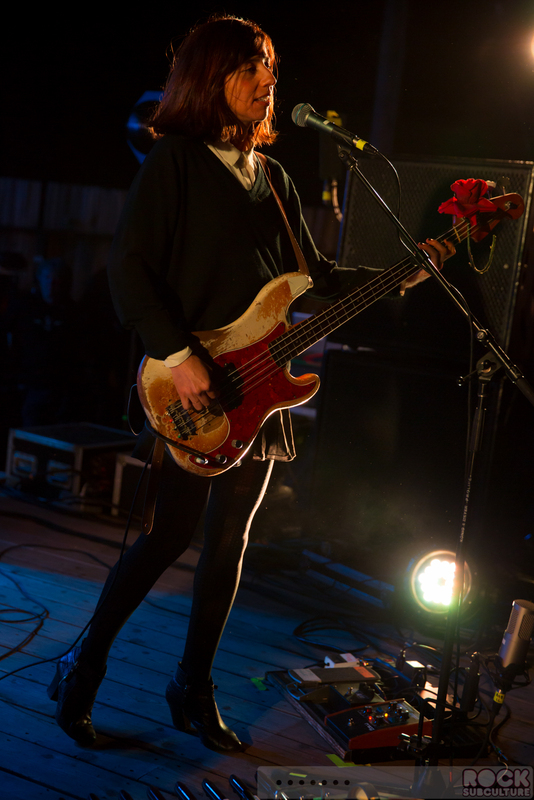 I really enjoyed both Kim and Paz, and both bring a different style and presence to the band, but something about Paz really seems to click with the group. 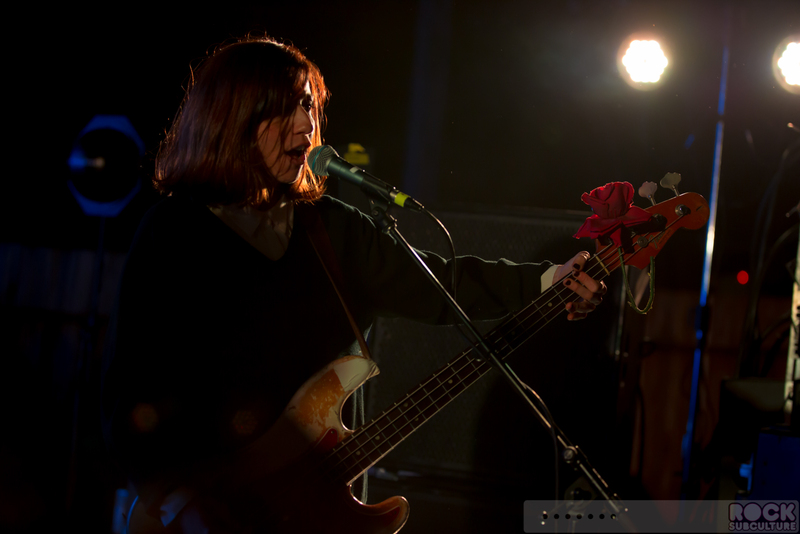 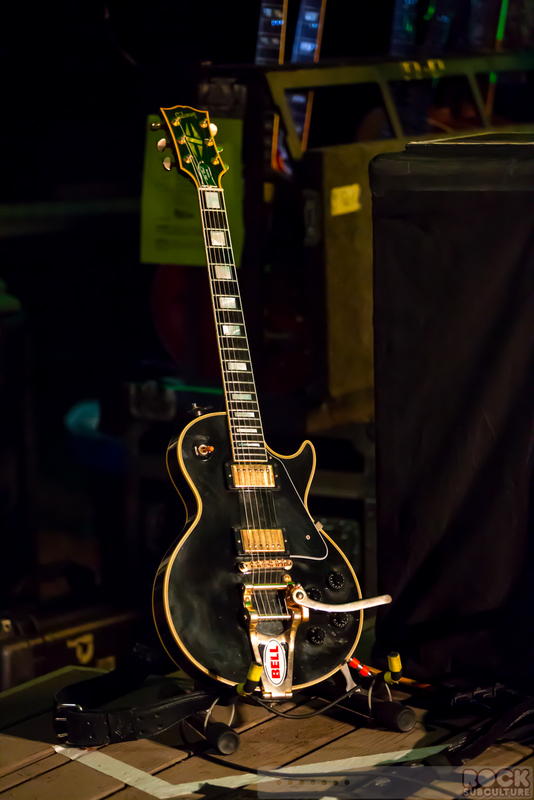 She appeared to be having a great time, and was at ease jamming through the songs (sans set list), following the lead of the original members as they shifted from one song to the next. 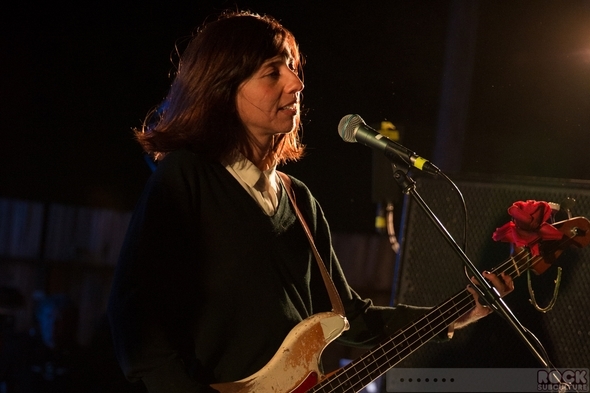 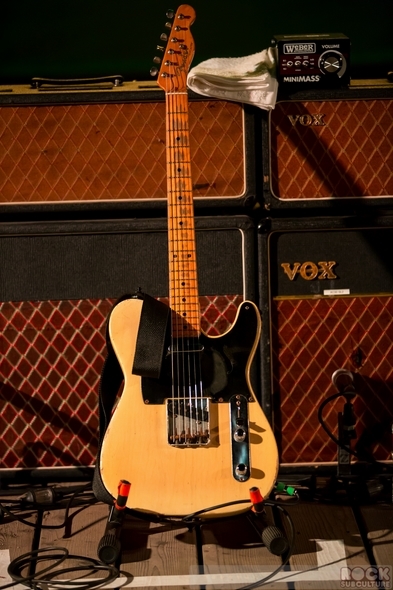 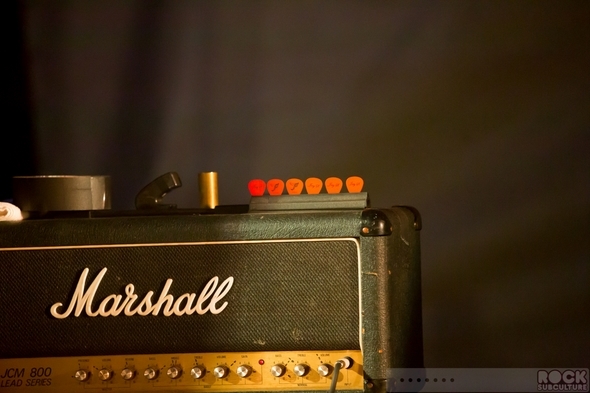 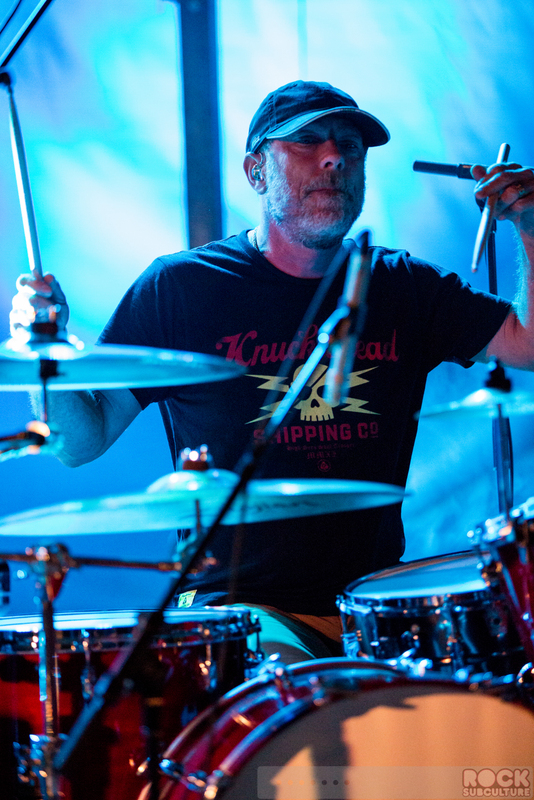 As noted in my prior reviews, my own personal reaction has kind of been that it is too bad that Kim Deal left, but if her being with the band meant no new material and no touring, I’d rather the rest of the band move on without her, as they have. I love the new material that the Pixies are putting out thus far, and the new songs played throughout these shows fit in perfectly, and make it all the more fresh and exciting. 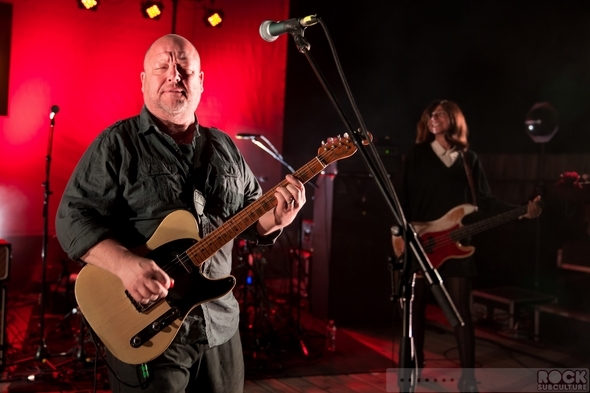 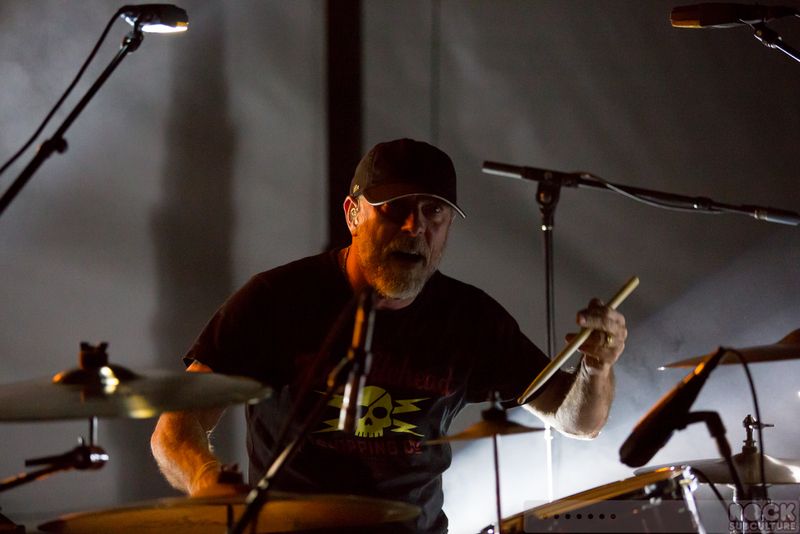 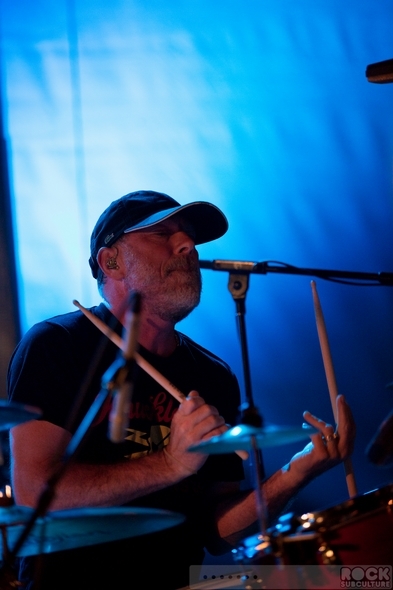 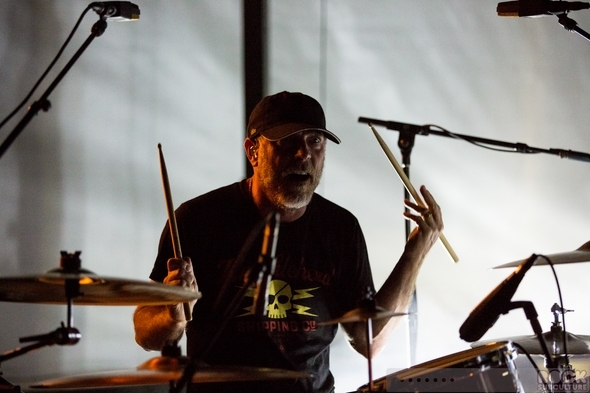 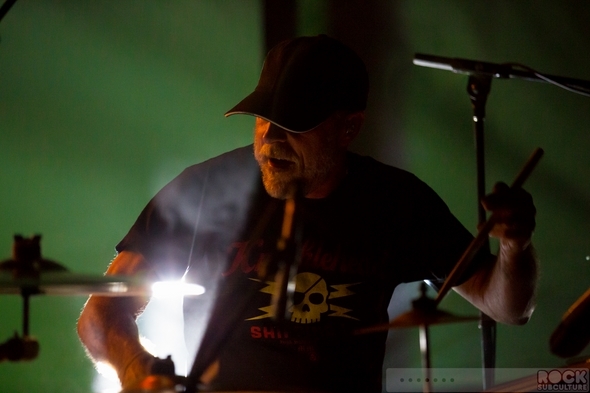 While the Oakland show was more of a flawless performance, the one in Big Sur featured one of the almost obligatory (and charming) slip ups / false starts and restarts, which Joey blamed on Black Francis. 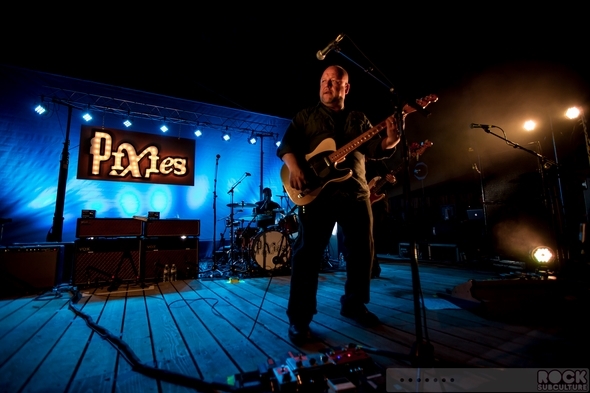 As mentioned in my past reviews, Pixies are one of my all-time favorite bands, and I think I saw them maybe half a dozen times back in the late 80s/early 90s, starting with their touring of Doolittle. 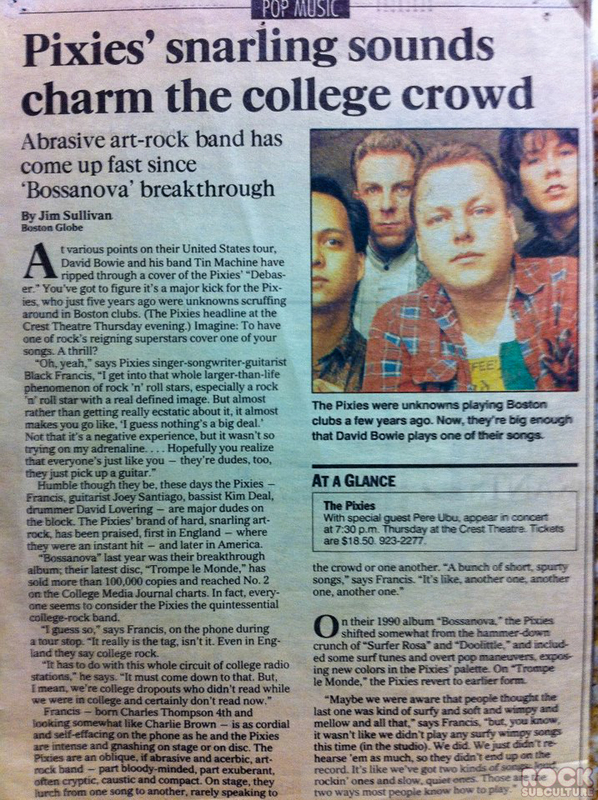 and everything that followed, and even opening for U2 (which was my only negative Pixies concert going experience as the U2 fans wouldn’t stop talking over their performance). 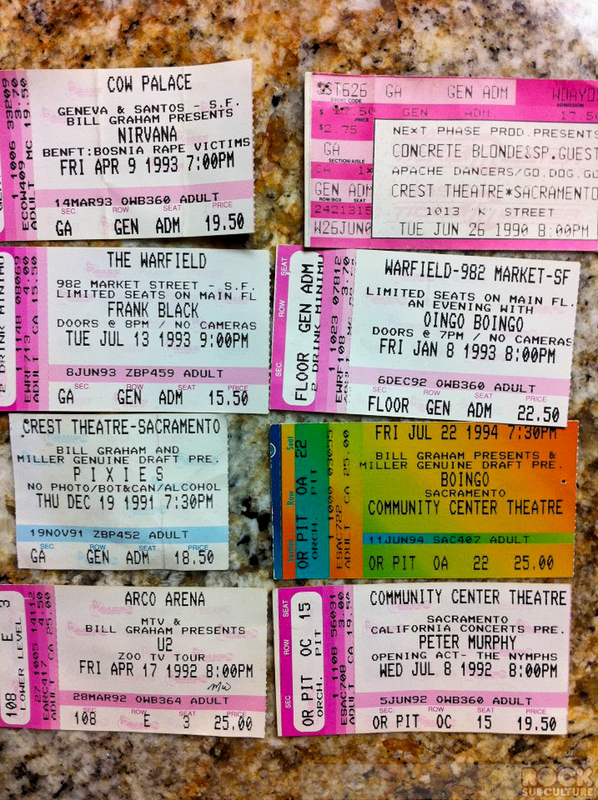 I’m a bit of a pack rat with such things, and just went through some photos I posted on my Facebook page in the past and found a photo I took of some old ticket stubs and even an old “mainstream newspaper” article about one of the concerts I attended. The did do some different takes on familiar songs this time around, which was awesome (not as many as in Oakland though), but the great thing about this band is that their live sound matches the studio sound, and those classic songs. 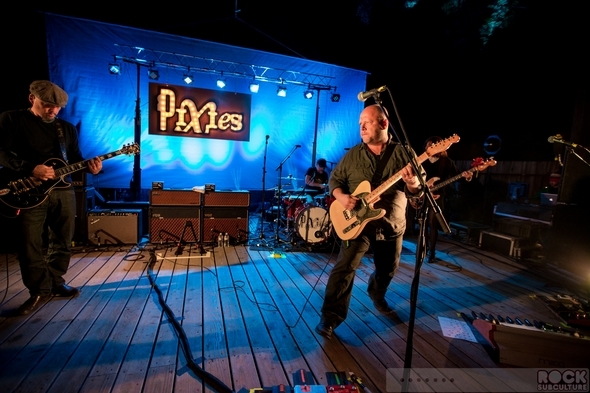 So for me personally, it doesn’t get much better than seeing them play live. 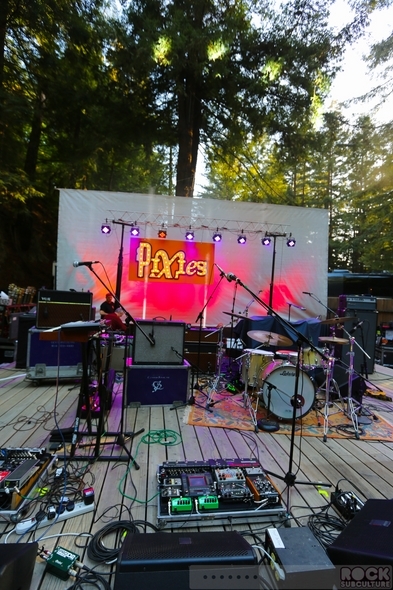 As with Oakland, they played about an hour and forty or forty-five minutes, though many of their songs are so short, it felt longer. 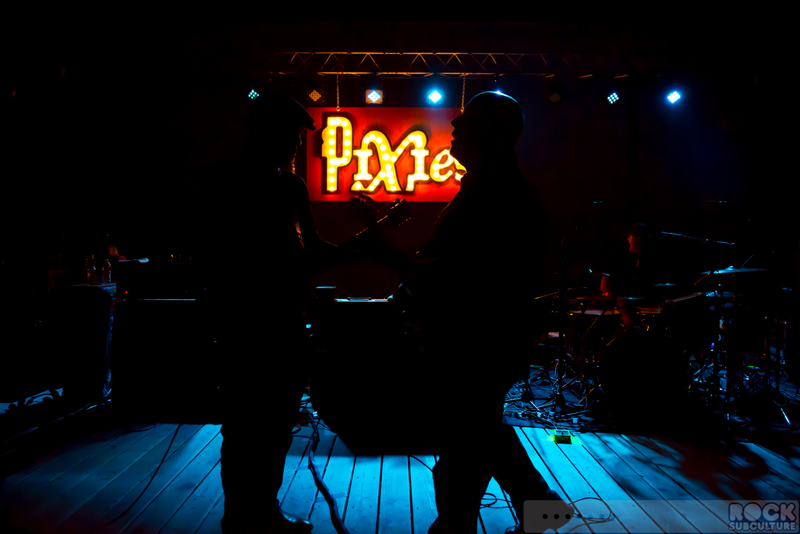 It was definitely the most intimate Pixies show I’d been to, and it was quite surreal to stand a few feet from Joey Santiago and Black Francis (and with the short stage and being six foot, almost eye level) and think back to seeing them back in the late 80s and very early 90s… and here I was, more than two decades later, enjoying a stellar concert in the woods of Big Sur, standing right between them. I wish the teenage me could have known what was in my future. 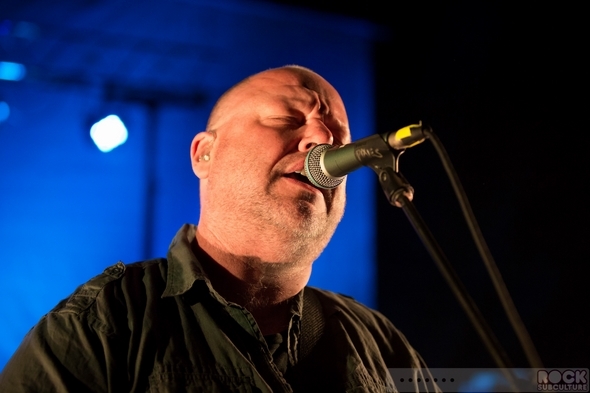 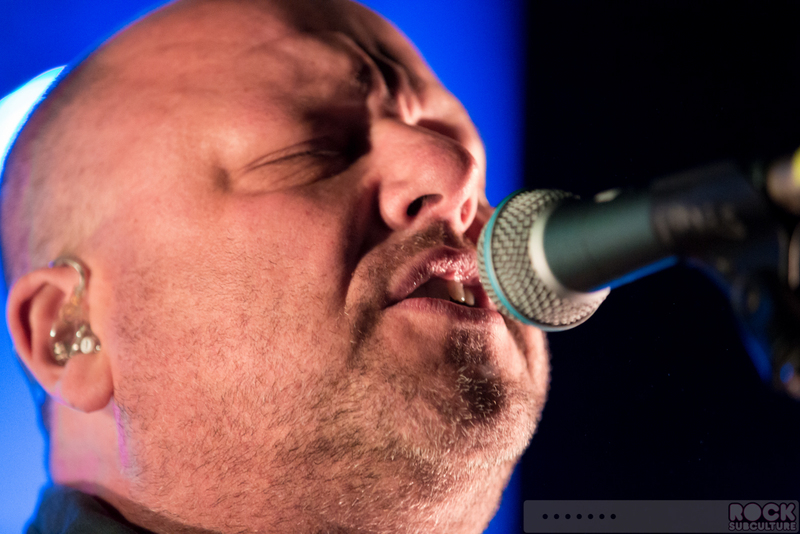 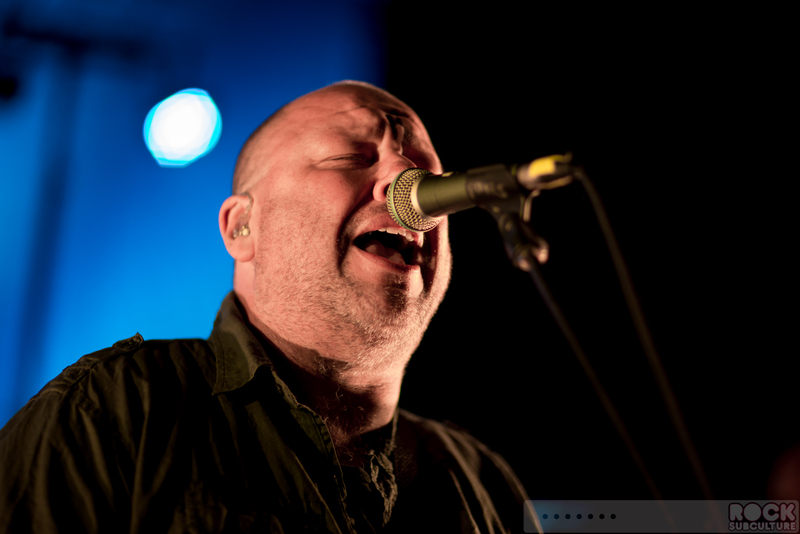 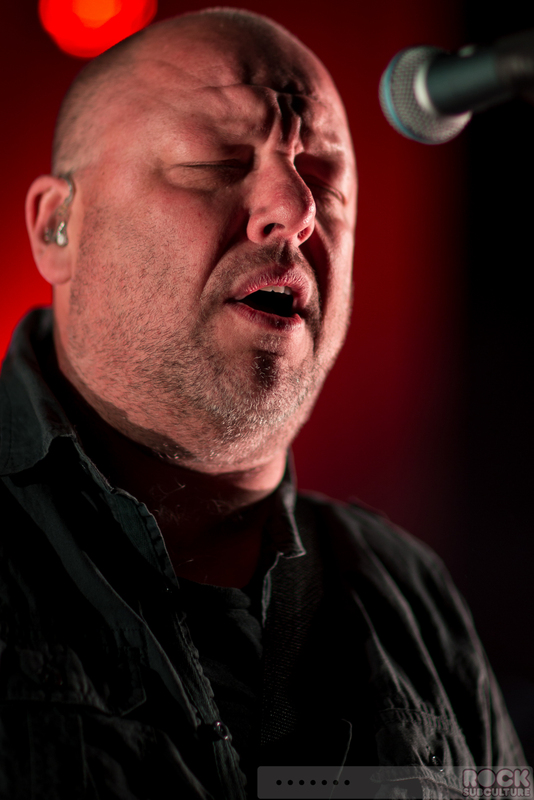 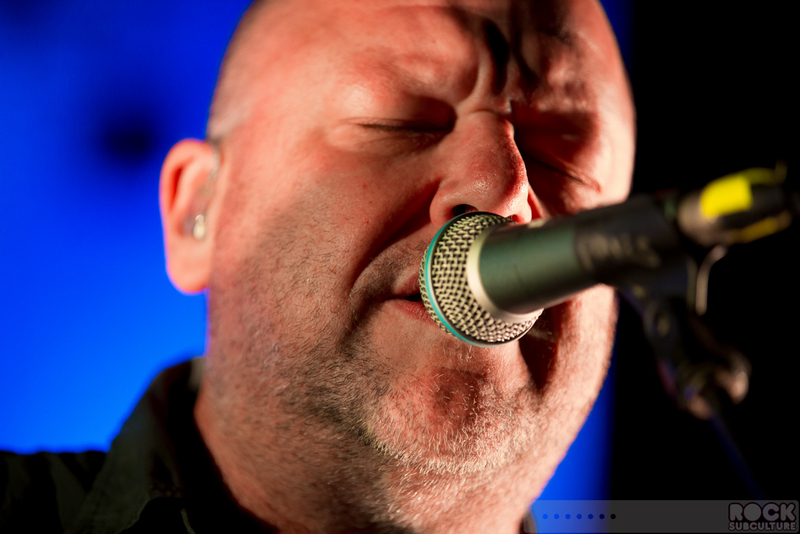 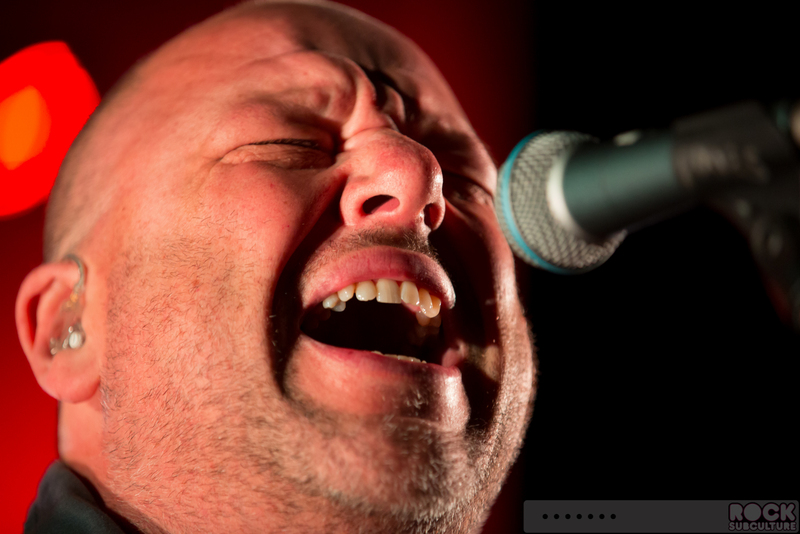 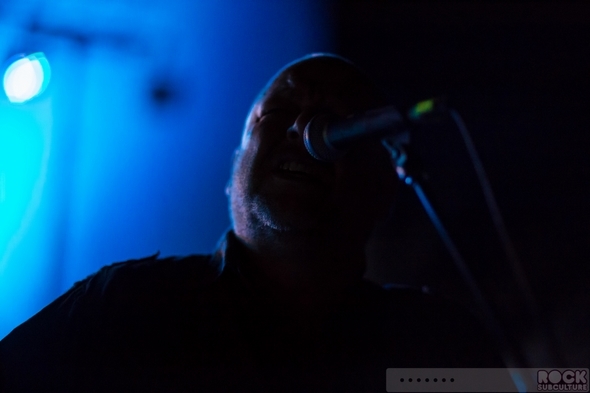 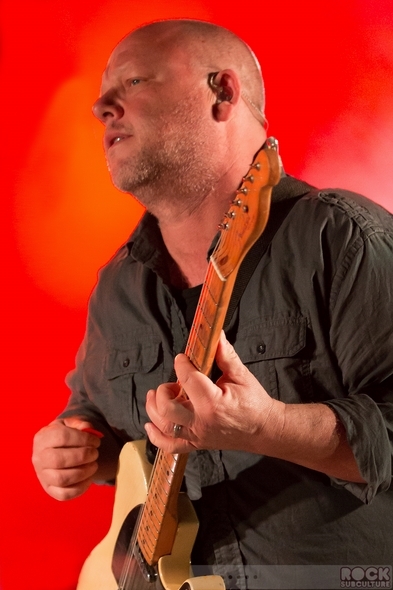 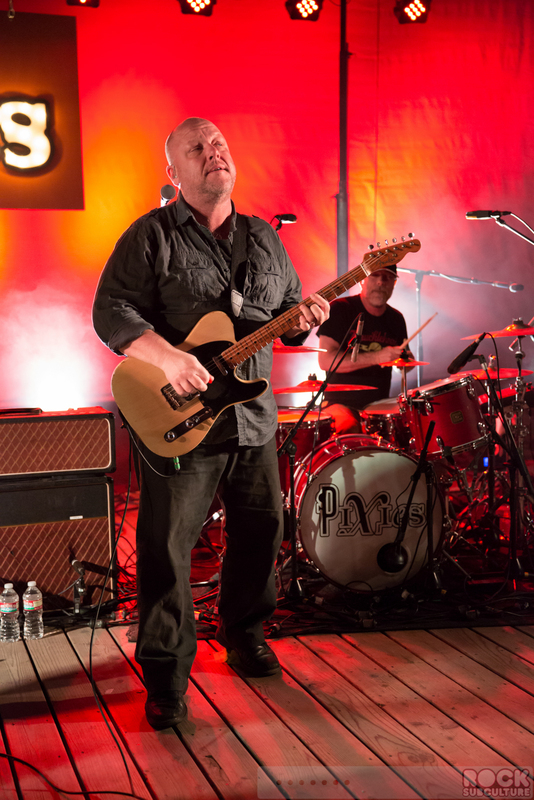 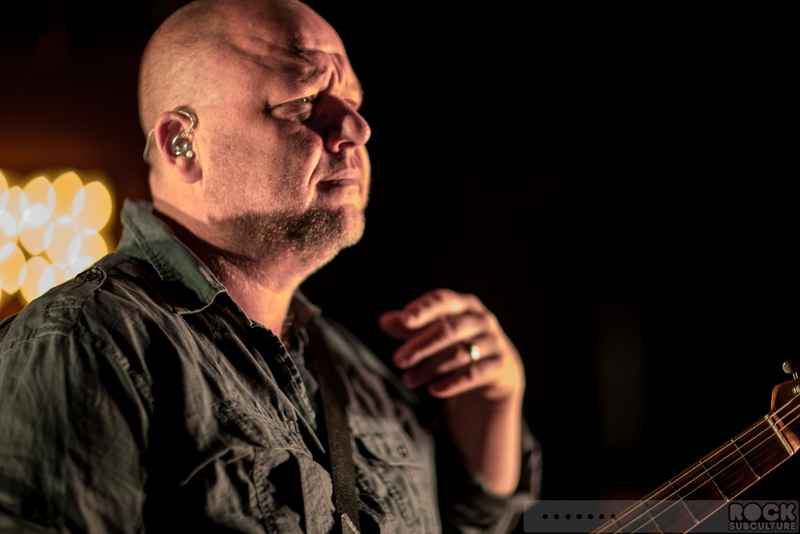 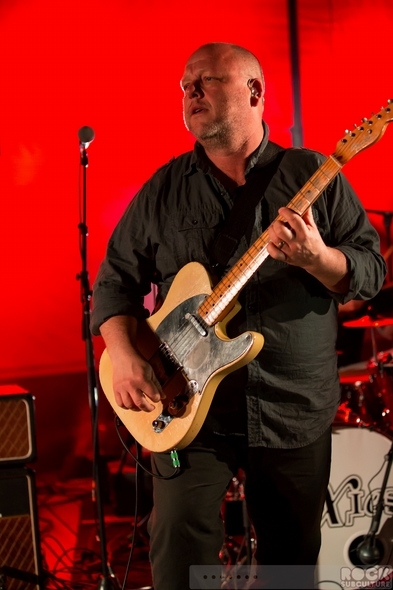 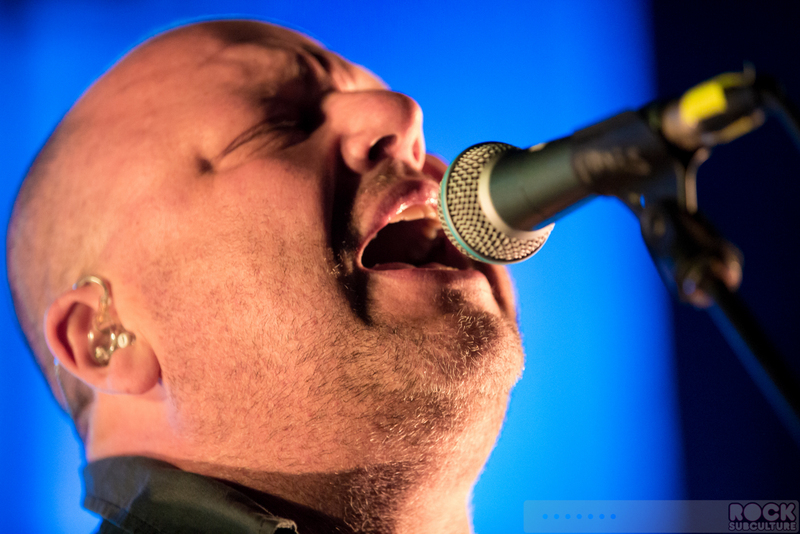 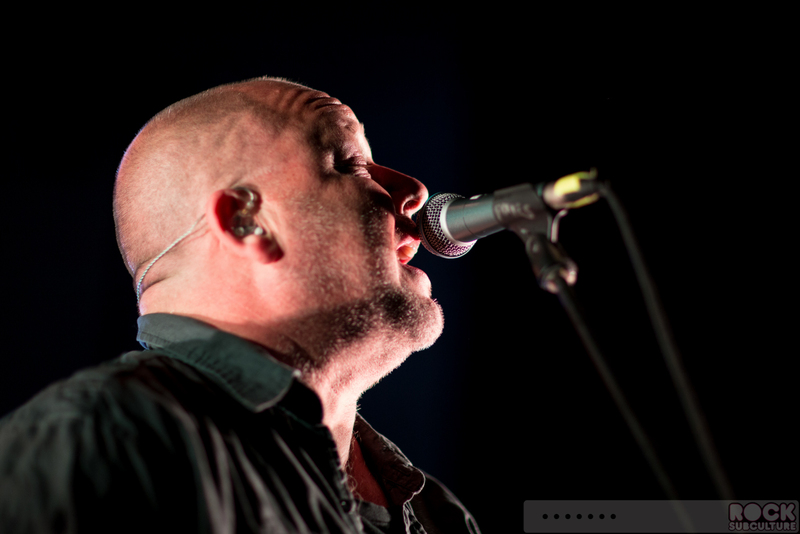 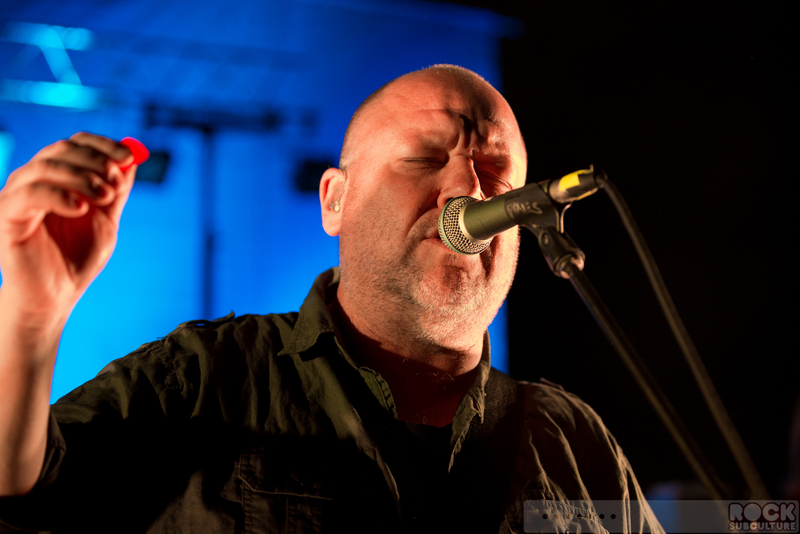 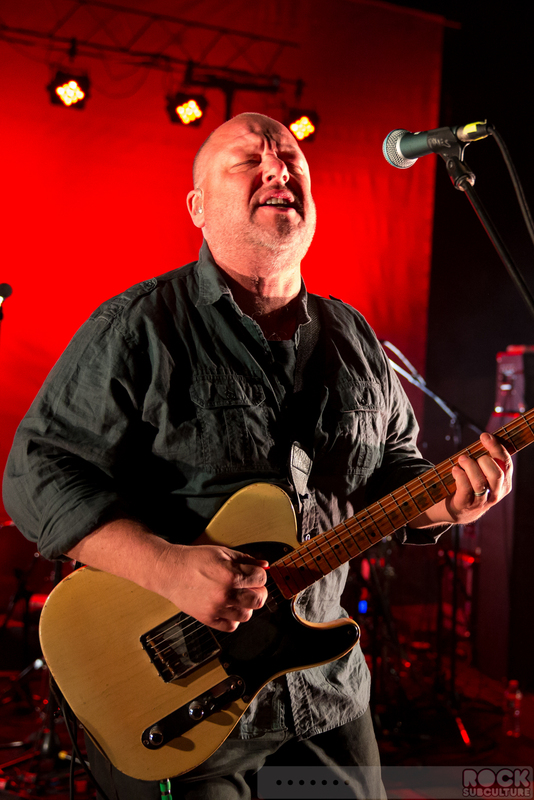 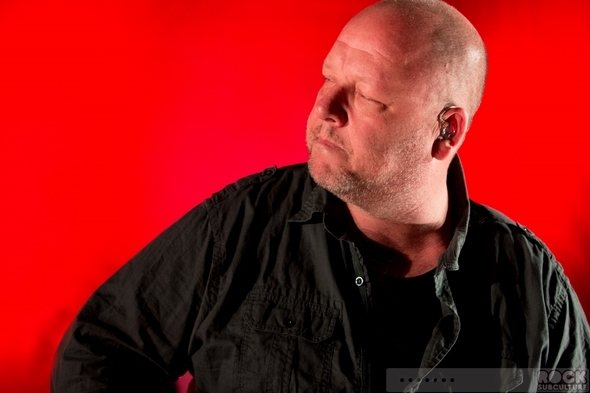 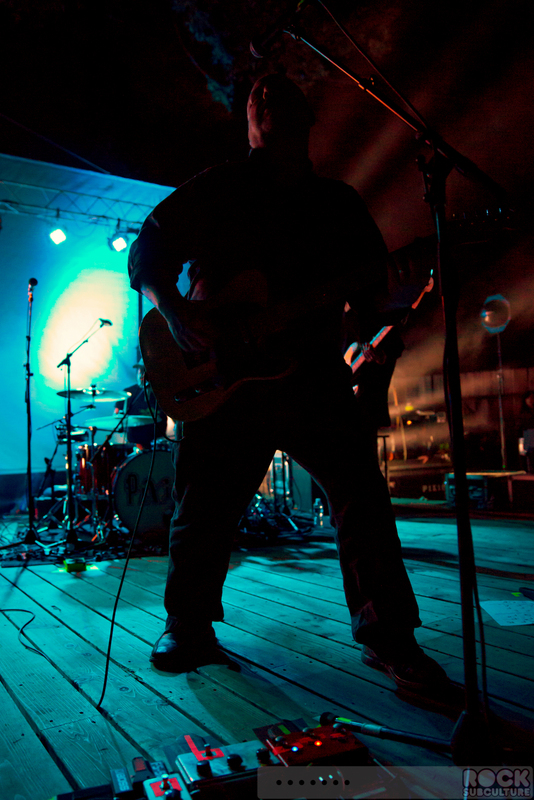 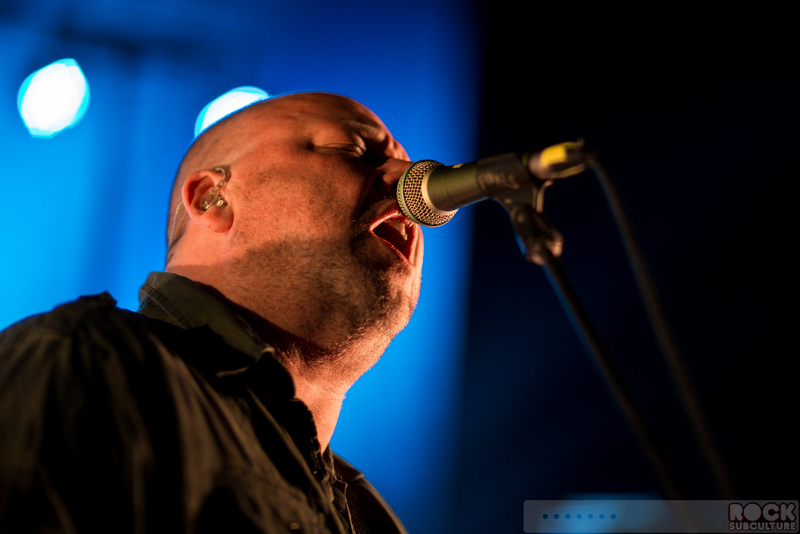 Black Francis is interesting to watch play, as his eyes are mostly closed, or looking over the crowd. 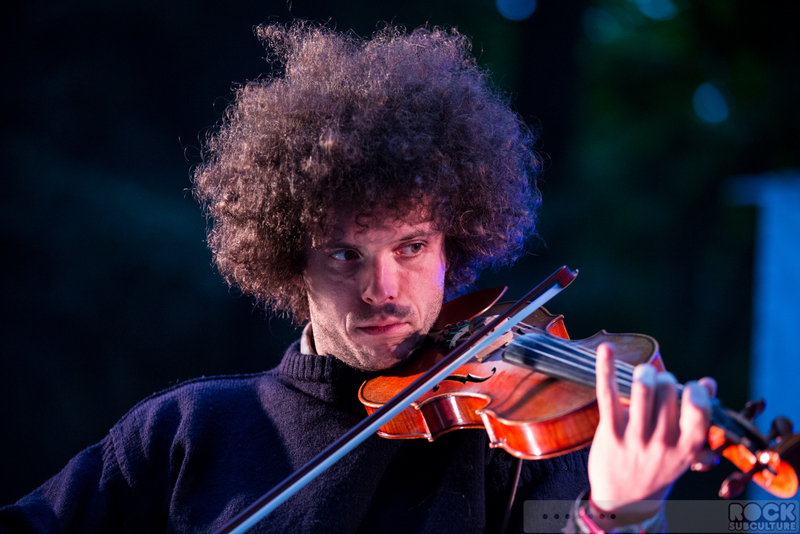 Any eye contact with fans is brief – more like a blink, if that – so he is definitely in some artistic zone when he plays. I did not take notes as to the set list, but was hoping someone else might have and that I could track it down, and will update this article (and credit) if I can eventually find it. 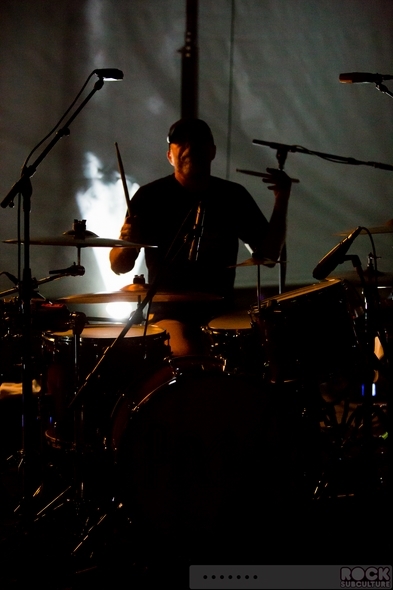 Truly a fantastic experience for me – one I will never forget. 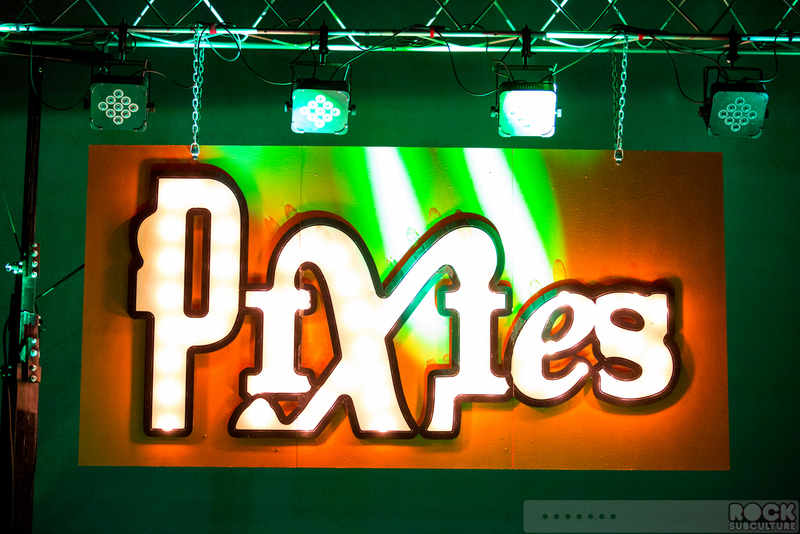 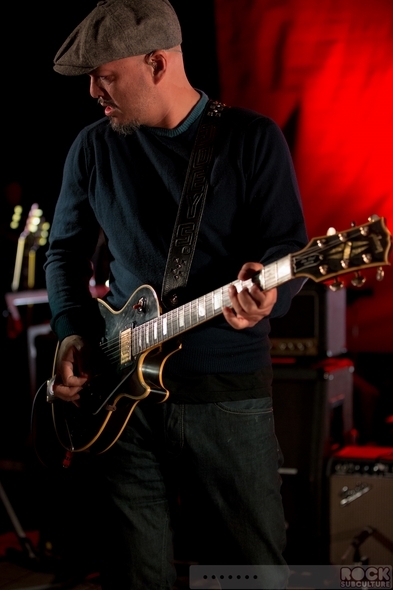 Probably one of the best concerts a Pixies fan could ever attend.